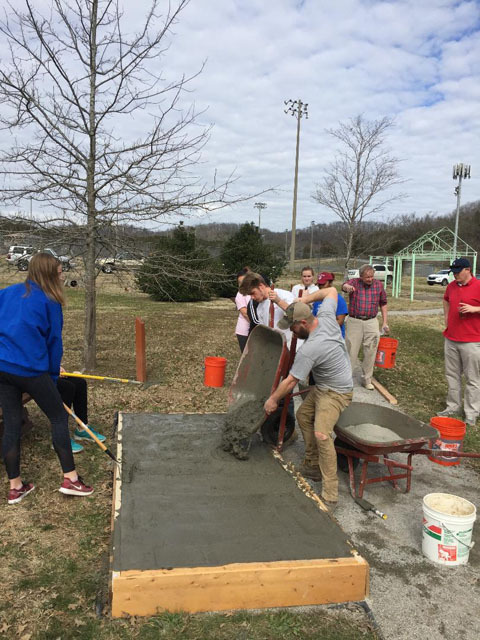 On March 30th, Williamson County Lions along with realtors from Benchmark Realty Mt Juliet office constructed raised vegetable beds at the Tennessee School for the Blind. 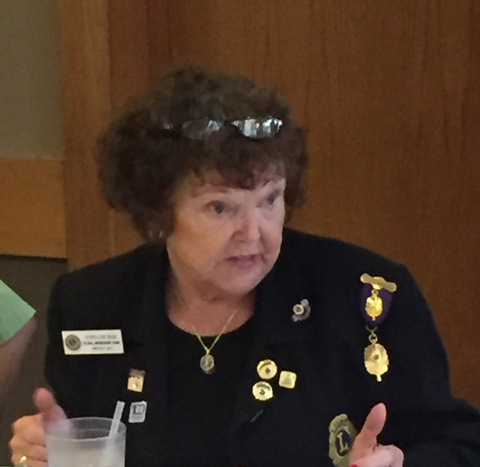 At the District 12I Convention, Williamson County Lion Marjorie Crowell was elected as District Governor Elect for 2019-20 with the office starting on July 1st. Also elected was Tommy Goetz as 1st Vice District Governor Elect and John Thyen as 2nd Vice District Governor Elect. 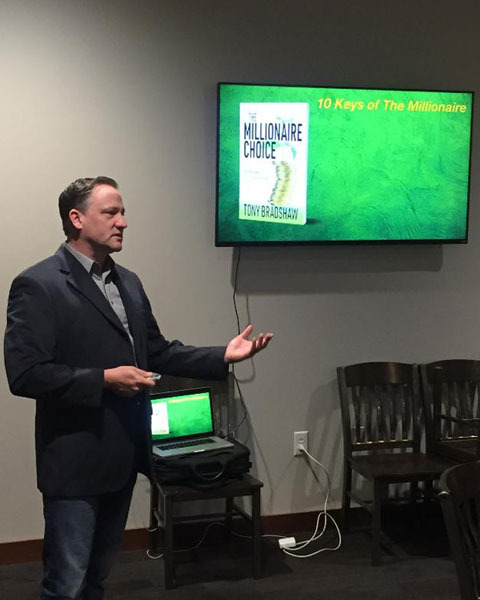 At our club meeting on February 14, 2019 we enjoyed meeting and listening to author Tony Bradshaw who talked to us about his book The Millionaire Choice. 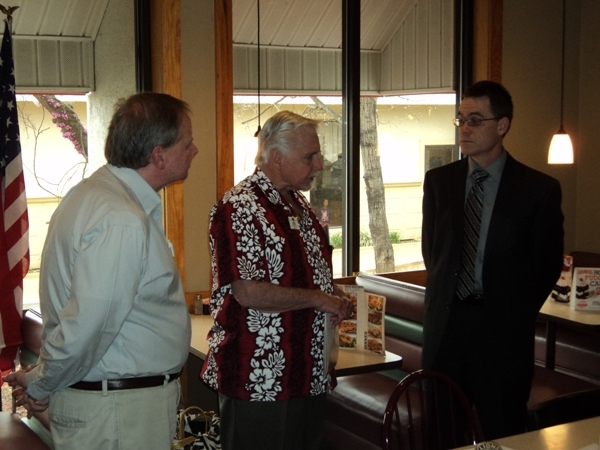 We enjoyed a large turnout at our club meeting on February 14, 2014. 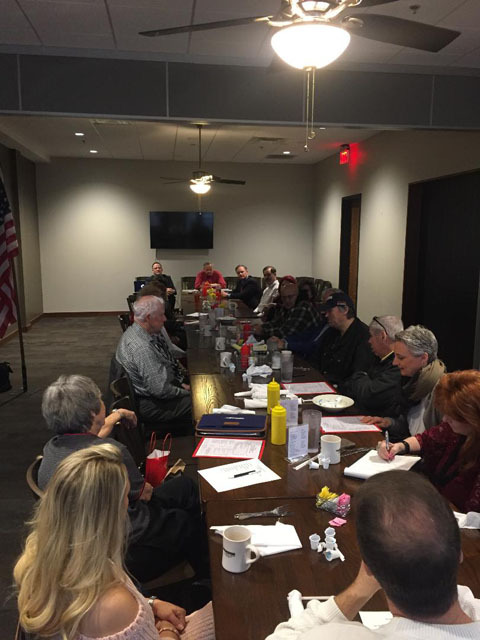 We enjoyed a large turnout at our club meeting on February 14, 2019. 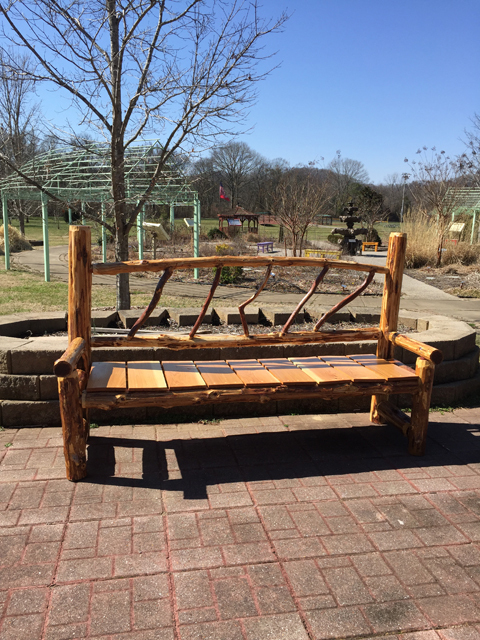 We had a great turnout of volunteers on Feb 2nd at Sensory Garden for the Blind. 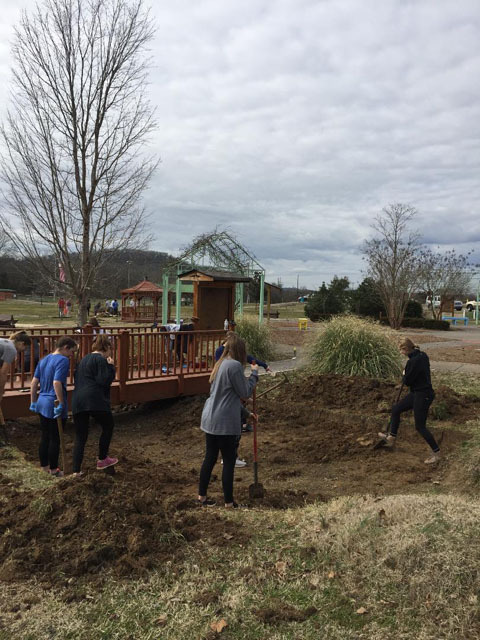 Thank you to the Franklin Girl's Cotillion, Franklin High School Interactive Club, Franklin High School National Honor Society and Tennessee Promise for spending their Saturday helping to improve the Sensory Garden for the Blind. 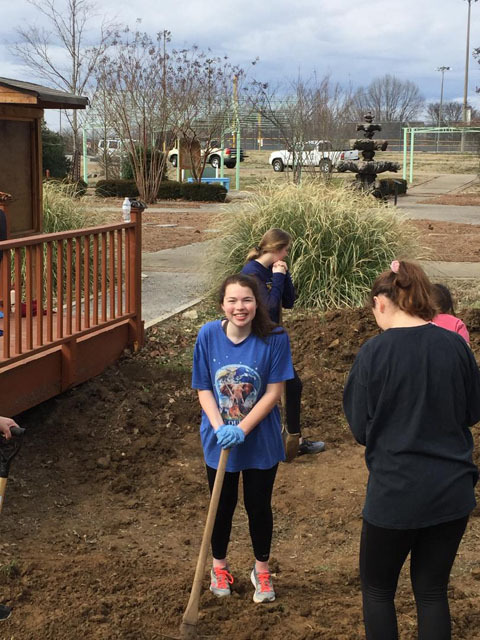 We had a great turnout of volunteers on Feb 2nd at Sensory Garden for the Blind. On December 14th we attended the Tennessee School for the Blind Lions Day Christmas Program and all of the Lions sang Christmas songs to the students. 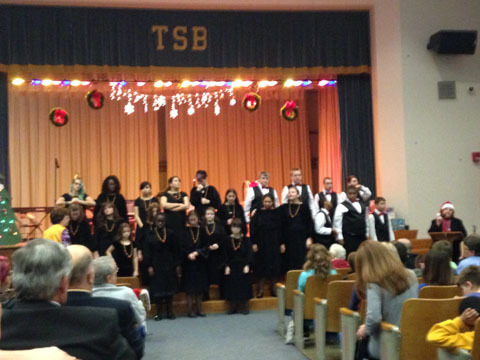 On December 14th, we attended the Tennessee School for the Blind Lions Day Christmas Program and listened to the TSB Band and Choir perform. 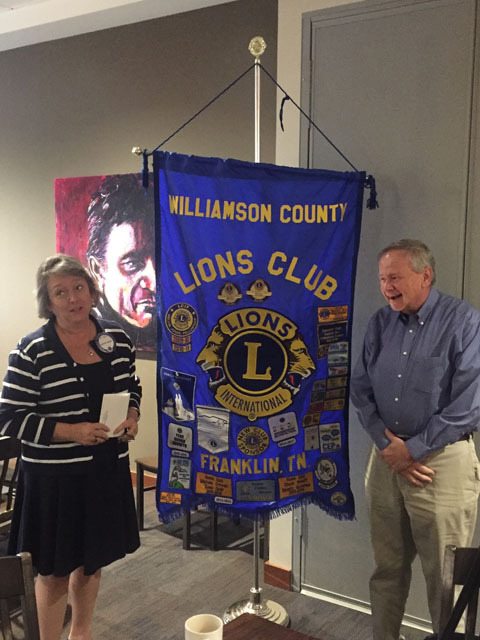 Williamson County Lions Club 1st Vice President Kathey Grodi presents Lion Chuck Wells with a token of the club's appreciation for all of his volunteer efforts. Our guest speaker on Oct 11th was Harry Dunn who spoke to our club about the mission of the Shriners. 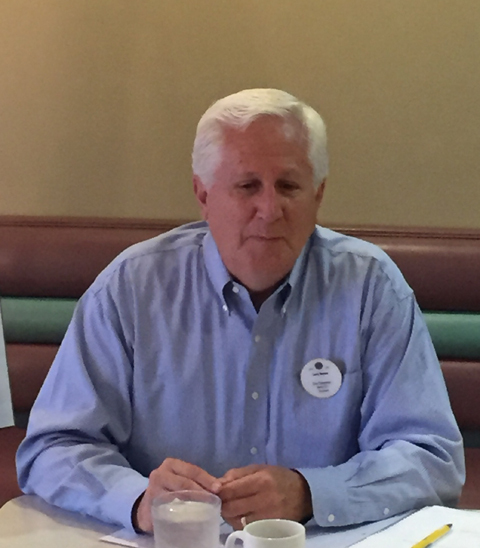 The Williamson County Lions Club Officer Installation for 2018-19 was led by PDG Keith Lawrence at our club meeting on July 12th. 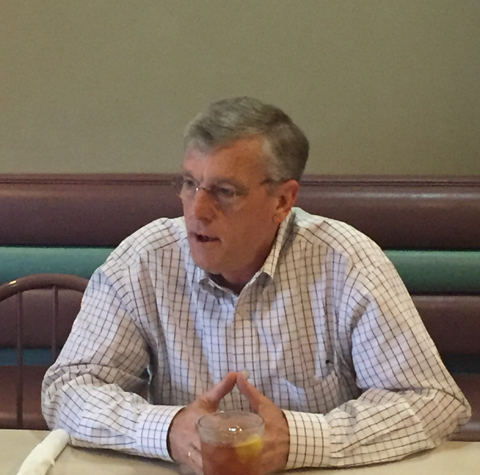 On May 24th, our guest speaker was Jer Geiger who spoke to our club about the Pork Industry. Jer currently serves as Health Assurance Verterinarian for PIC, a global swine genetic company in Hendersonville, Tennessee. 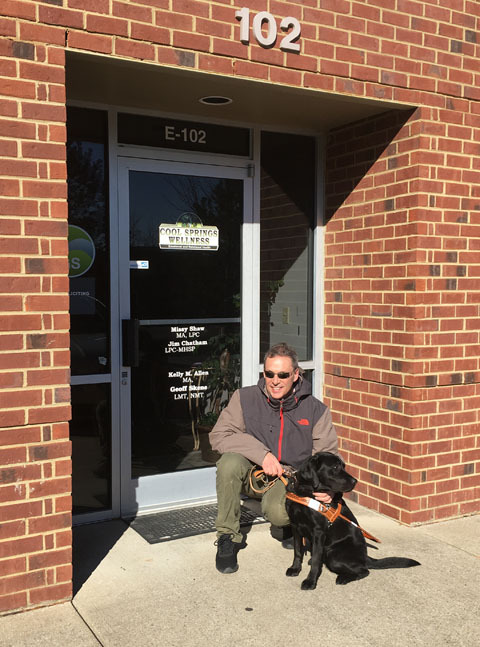 Former WCLC member Geoff Skene stopped by a recent club meeting to show us his new guide dog Betty, who is from the Leader Dogs for the Blind. 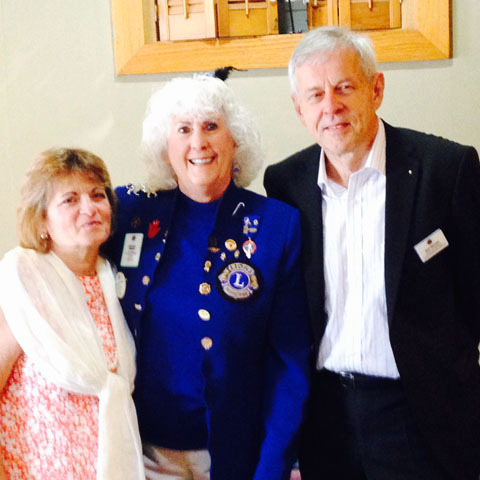 Pictured here with Geoff and Betty are 2nd Vice District Governor Marjorie Crowell and Club President Ryan Reid. Former WCLC Lion Geoff Skene with his new guide dog Betty who is from Leader Dogs for the Blind. 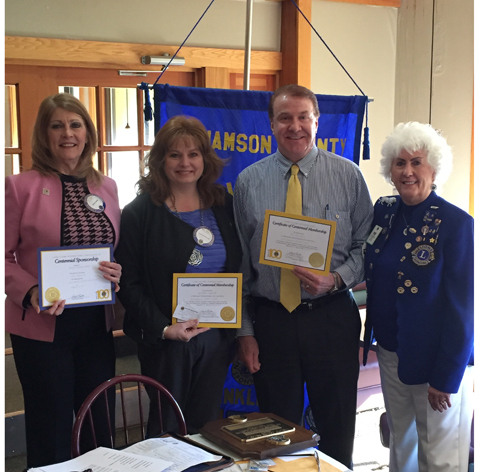 Our newest members Scott and Stephanie Richardson were inducted by WCLC member and District 12-I Second Vice District Governor Marjorie Crowell at our club meeting on January 24th. 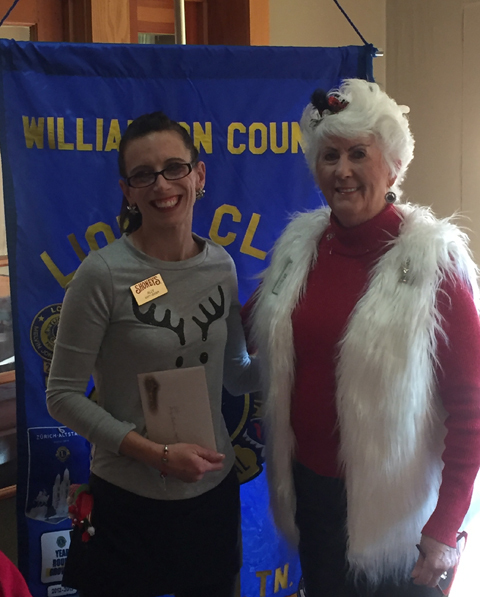 Our guest speaker on December 14th was Williamson County Lion Kathey Grodi who spoke to our club about Individual Credit Reports. 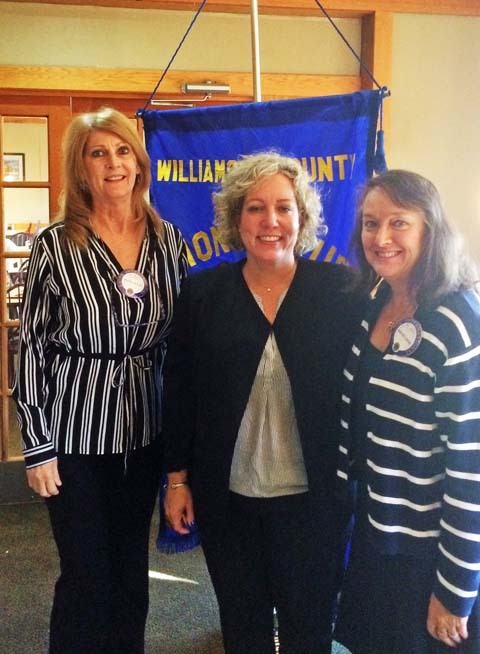 Our Guest Speaker on November 9th was Colleen Hoke who is with Objective Clinical in Nashville. She is seen here with club members Diane Crowell Adams and Kathey Grodi. 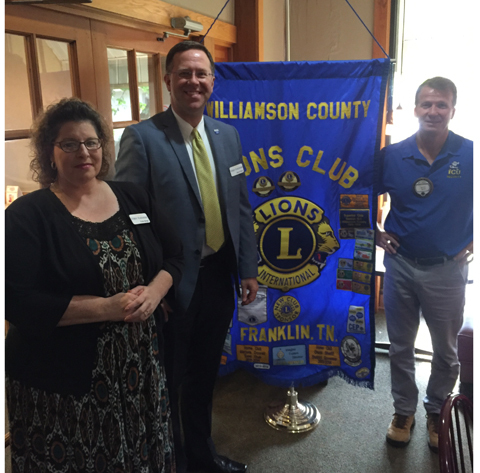 Our Guest Speaker on Oct 26th was Greg Bancroft who is the Community Engagement Leader for Thrivent, seen here with Lion Diane Crowell Adams and Club President Ryan Reid. 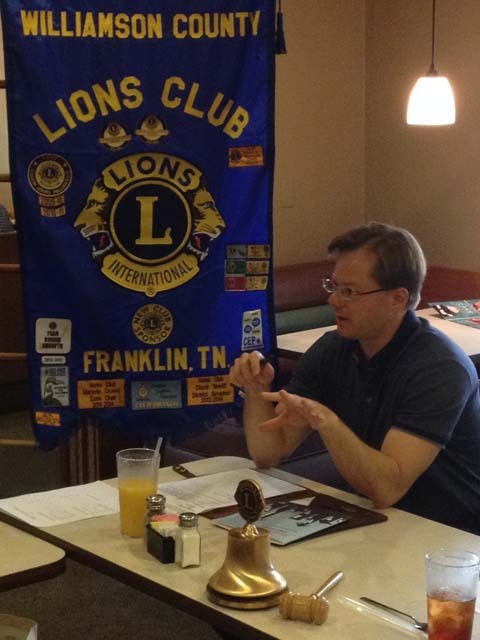 Our guest speaker on August 10th was Casey Cavanah who spoke to our club about The Bank of Nashville. Casey is pictured here with club president Ryan Reid and program chair Diane Crowell Adams. Our guest speakers on July 27th were Darryl Clark and Vicki Burge from First Farmers Bank who spoke to our club about our new partnership with their bank. They are pictured here with club president Ryan Reid. 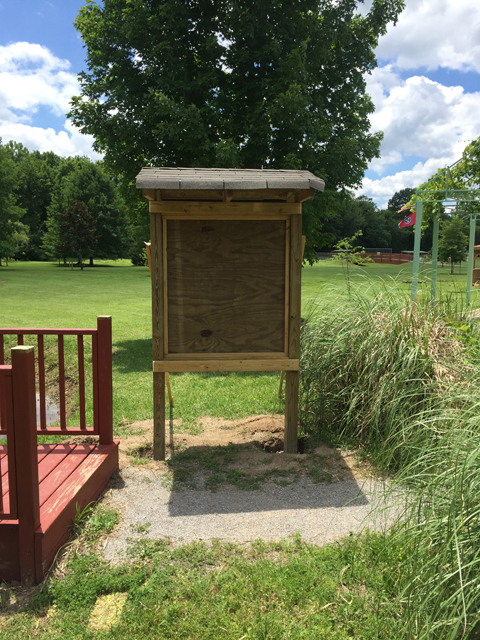 On Saturday June 3rd, Boy Scout Joshua Steele from Troop 747 installed two new display cases at the Sensory Garden for the Blind as part of his Eagle Scout Project. 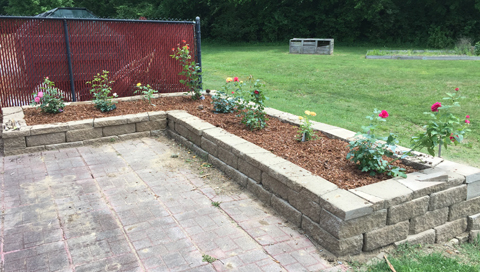 Thank you to all of our volunteers who helped to plant the rose beds at Sensory Garden for the Blind. 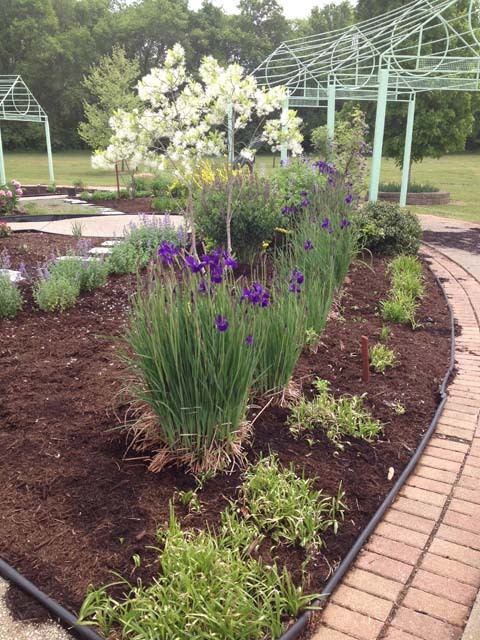 The planting of the rose beds at the Sensory Garden for the Blind was started on May 20th. 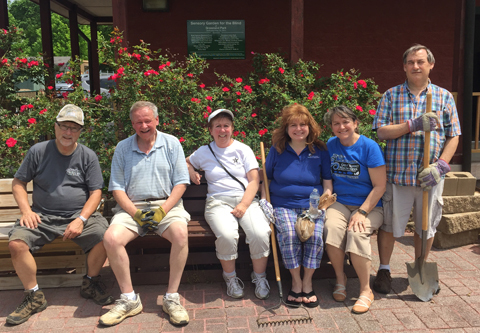 These are some of the nine volunteers who came out for a workday at the Sensory Garden for the Blind on Saturday April 29th. 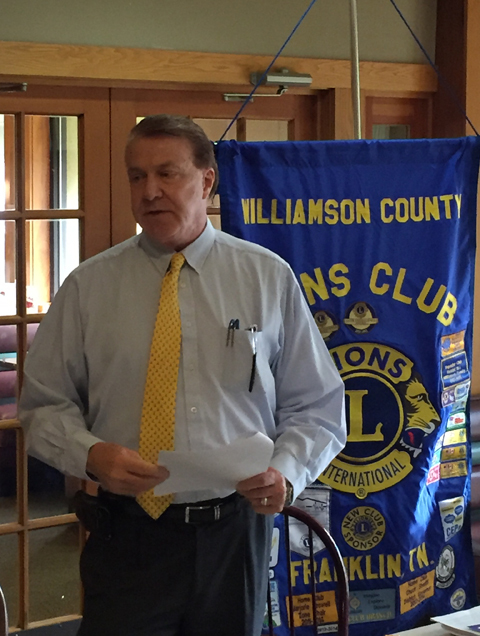 On April 13th, Williamson County Lions Club President-Elect Don Reid discussed his views for the Williamson County Lions Club in 2017-2018. 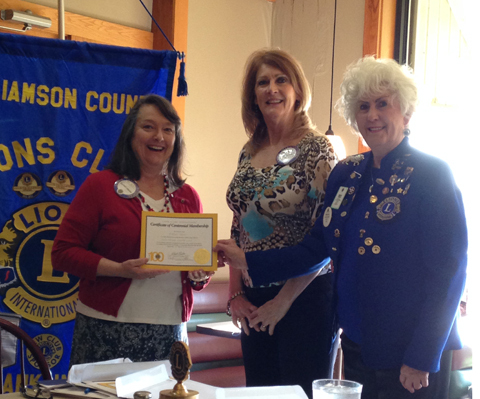 On March 23rd, new member Kathey Grodi was inducted as a Lion by Club President Marjorie O Crowell and Lion Diane Adams. 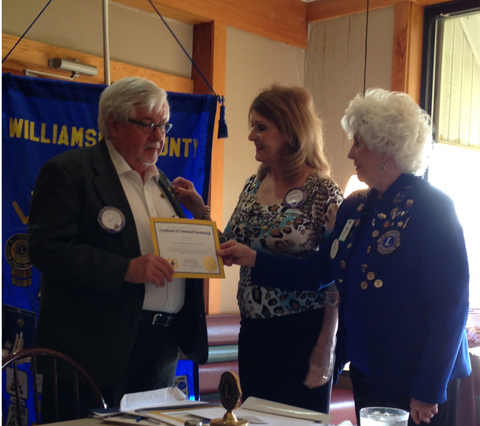 On March 23rd, new member Bob Hawkes was inducted as a Lion by Club President Marjorie O Crowell and Lion Diane Adams. 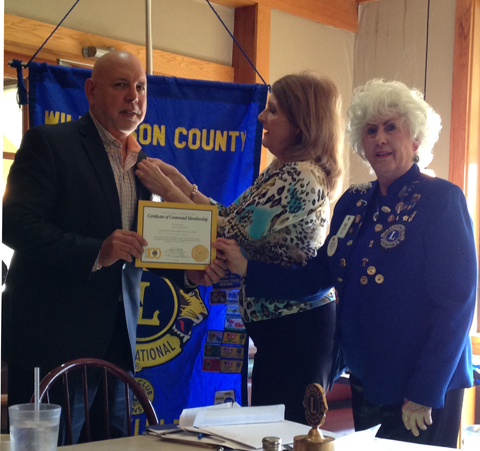 On March 23rd New Member Don Reid was inducted as a Lion by Club President Marjorie O Crowell and Lion Diane Adams. 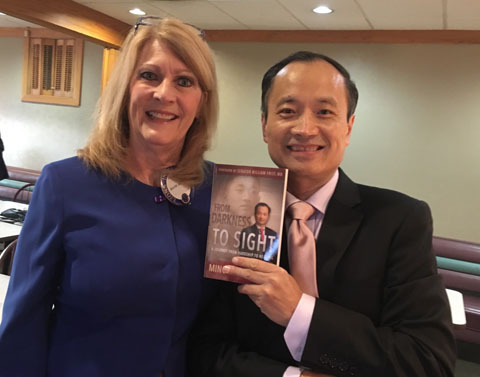 On March 23rd, our guest speaker was Debra Sheridan who is the founder for Faces of HNC which is a Franklin, TN based 501(c)(3) raising public awareness about and funds to help improve the quality of life for people after head and neck cancer treatment. 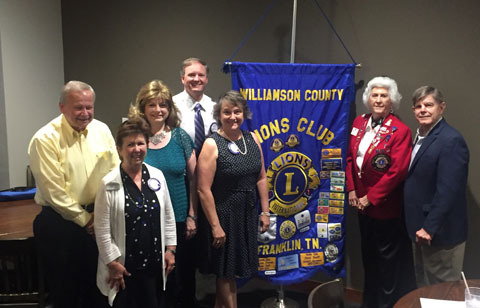 New members Deborah Moline and Jay Sellers were inducted into Williamson County Lions Club by Lion Diane Adams and President Marjorie O. Crowell. 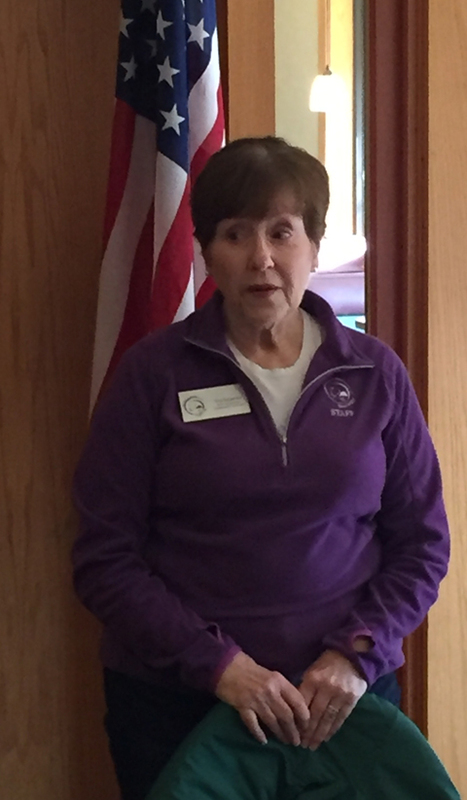 Our guest speaker on March 9th was Tina Carpenter who spoke to our club about Saddle Up which is a therapeutic equine program for children with disabilities. Our guest speaker on February 23rd was Jay Sellers, who is a financial advisor with Edward Jones, who spoke to our club about personal investing. 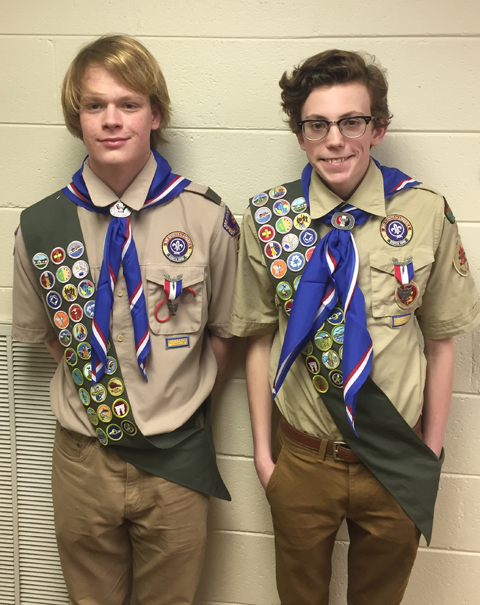 New Eagle Scouts Nate Arend and Ryan Coke from Troop 130 after their Eagle Scout Court of Honor Ceremony. 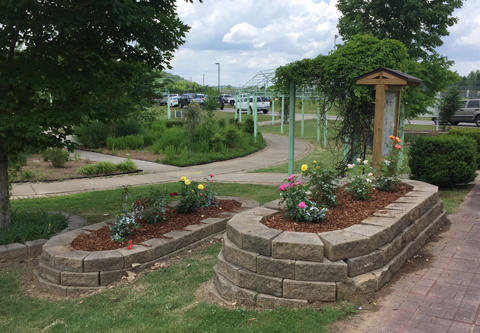 Both of their Eagle Scout Projects were service projects completed at the Sensory Garden for the Blind. Williamson County Lions Club President Marjorie O. Crowell was elected as District 12-I 2nd Vice Governor for 2017-2018. 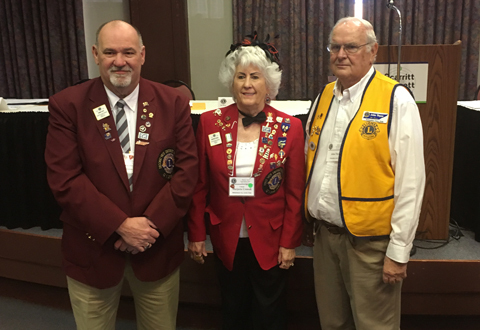 Here she is standing with current District Governor Phil Barnes, District Governor Elect Mark Kassing and District 1st Vice Governor Elect Paul Murray at the District 12-I Convention. 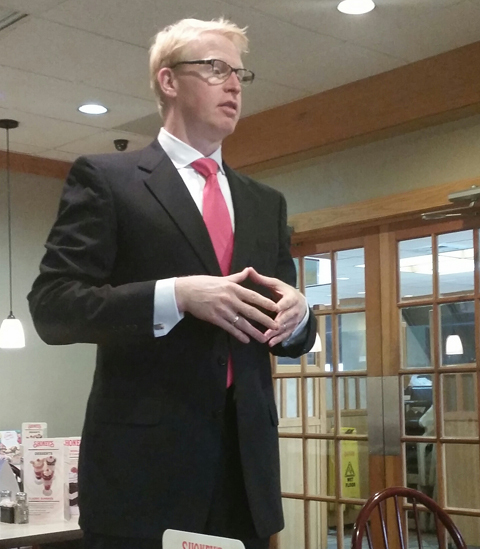 Our guest speaker on January 26th was Robert Hawkes from Thrivent Financial who spoke to our club about estate planning. 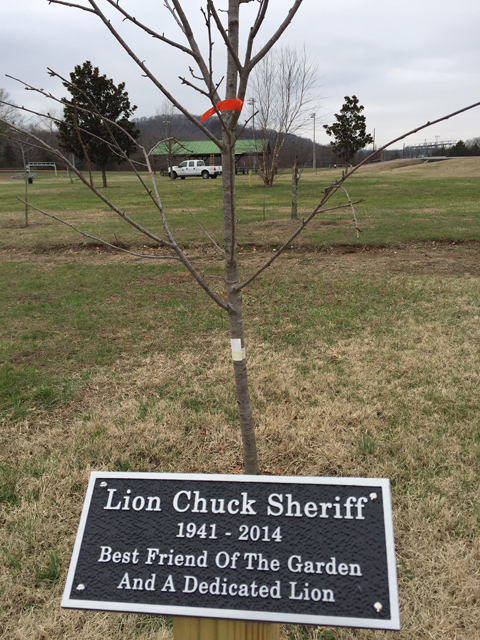 Lion Chuck Sheriff was one of the two people who started the Sensory Garden for the Blind and was inspirational in seeing that project become a reality. 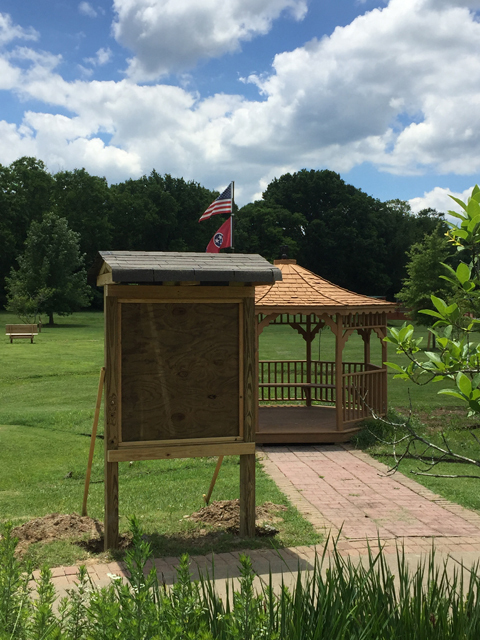 One of the two new display cases at Sensory Garden for the Blind constructed by Scout Ryan Coke for an Eagle Scout Project. 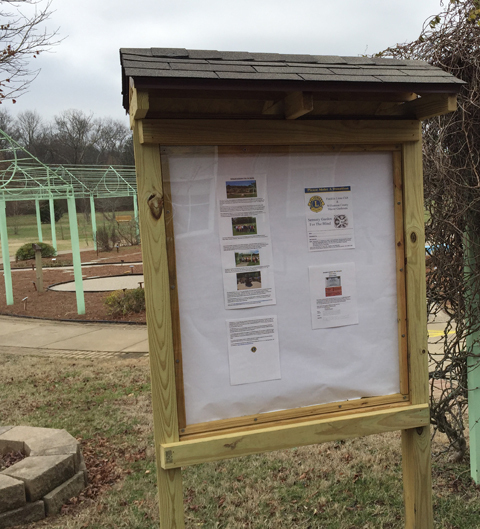 One of the two new display cases at Sensory Garden for the Blind constructed by Scout Ryan Scout for an Eagle Scout Project. Club President Marjorie Crowell presented Ally Gilson with a card to thank her for being our outstanding server at all of the club meetings in 2016. 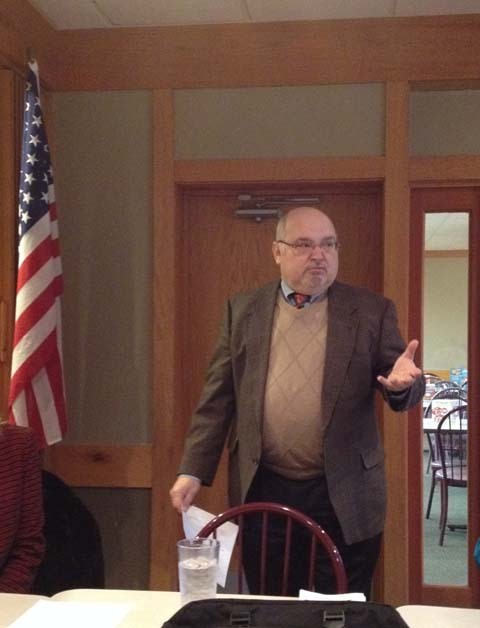 On December 22nd, our Guest Speaker was Kathey Grodi who spoke to our club about reverse mortgages. 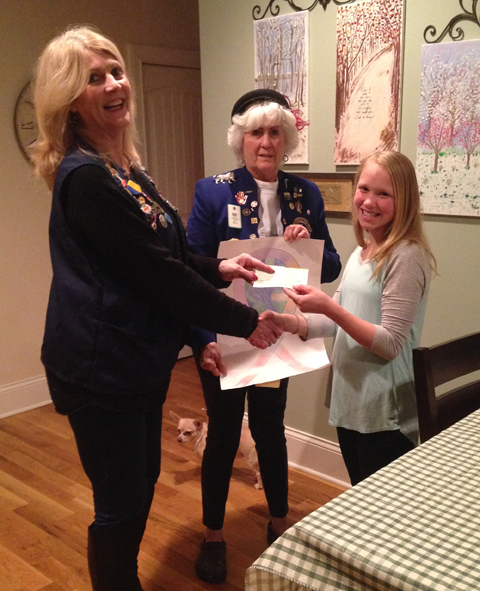 Program Chair Diane Crowell Adams presents Kinsley Reid with a check for $25 for representing Williamson County Lions Club in the 2016 Peace Poster Contest. 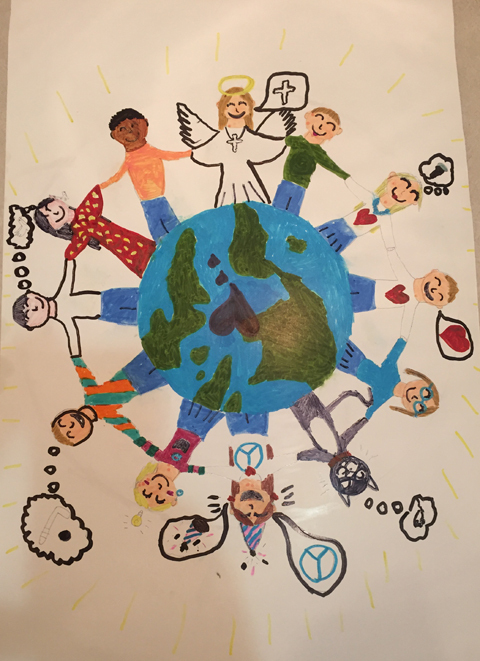 The 2016 Peace Poster Contest winner for Williamson County Lions Club was completed by Kinsley Reid who is 11 years old. 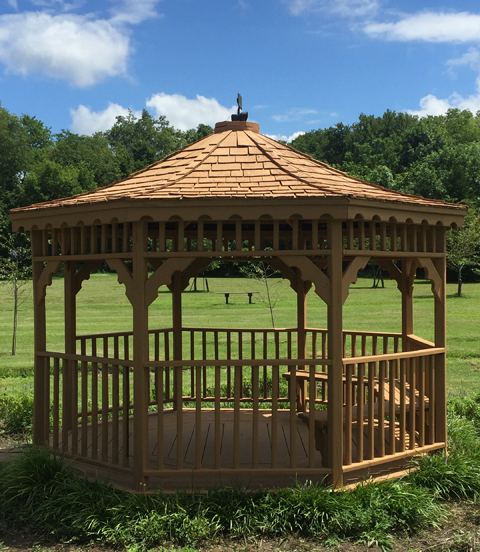 The theme this year was "A Celebration of Peace." 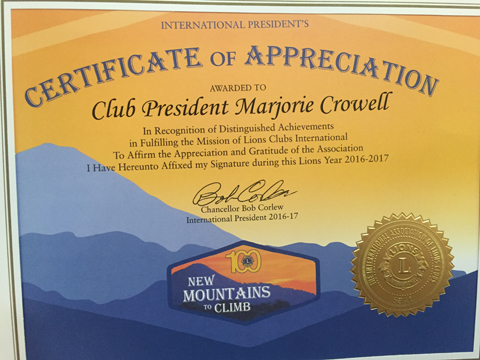 Club President Marjorie O. Crowell was presented with an International President Certificate of Appreciation. 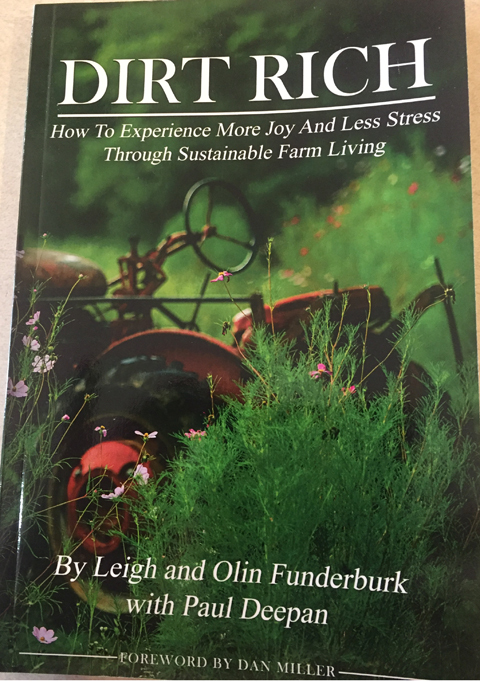 Our guest speakers on November 10th were Olin and Leigh Funderburk who talked about their farm and sustainable farm living along with their book "Dirt Rich." 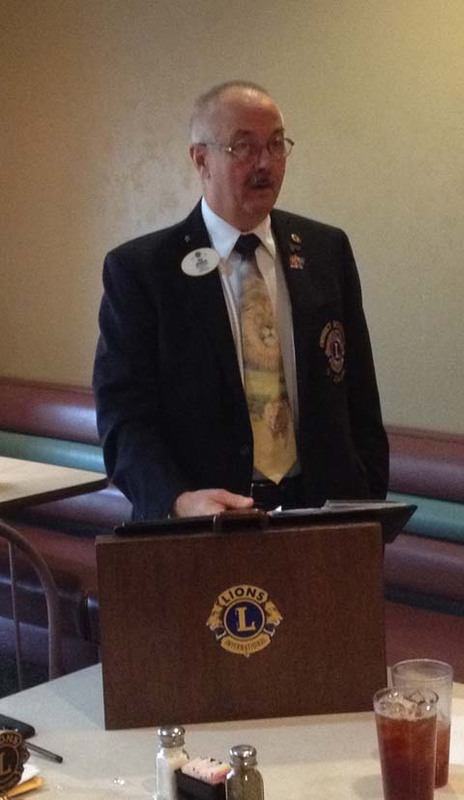 Our guest speaker on Oct 27th was Zone Chair Lion Larry Barnes. 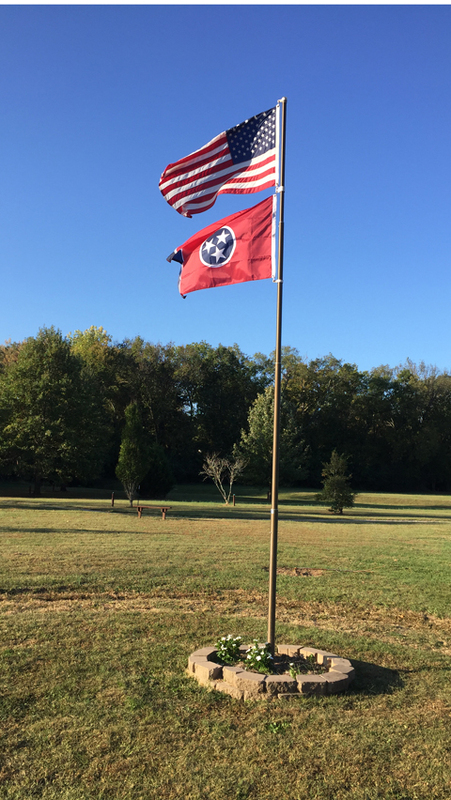 A beautiful fall morning looking at the flags flying in the breeze at the Sensory Garden for the Blind. New member Susan Nichols receives her new member certificate from Club President Marjorie Crowell. 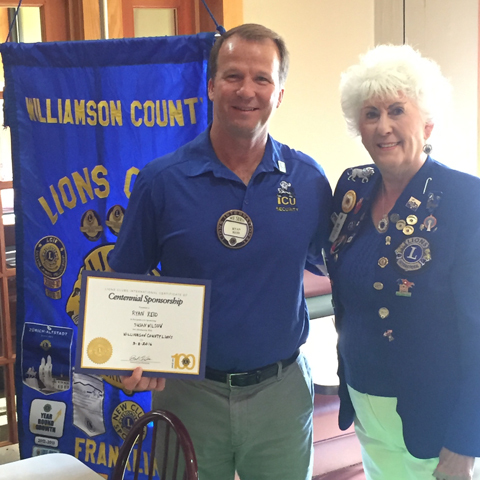 Club President Marjorie Crowell presented Lion Ryan Reid a Centennial Sponsorship pin and certificate for sponsoring new member Susan Nichols. 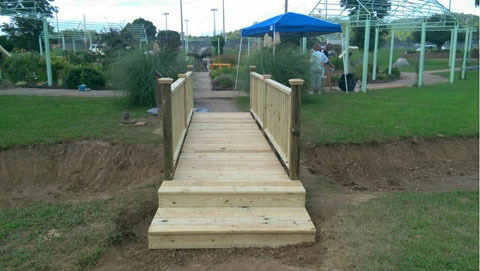 A recent photo from the Scout Jamboree held at Sensory Garden for the Blind. 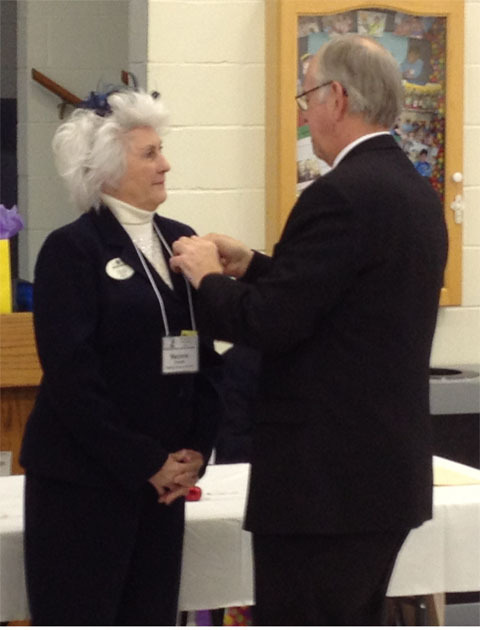 Our newest Williamson County Lion Club member Susan Nichols was inducted by Past District Governor Ed Lantz and her new member pin was attached by Club President Marjorie Crowell. 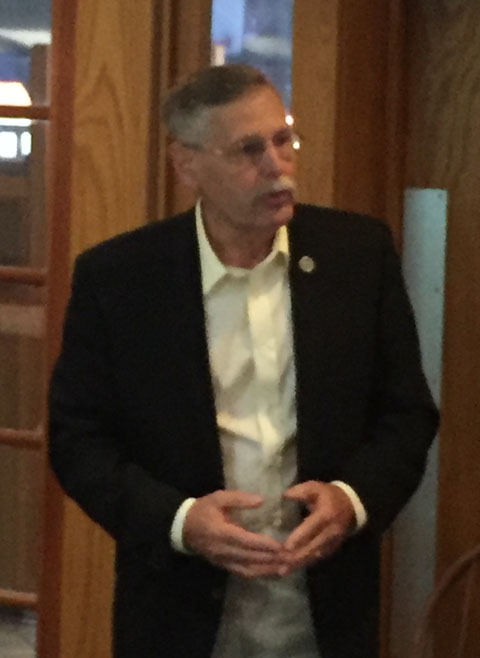 Our Guest Speaker on September 8th was Past District Governor Ed Lantz who spoke to our club about the Lions Club and ways to increase membership. 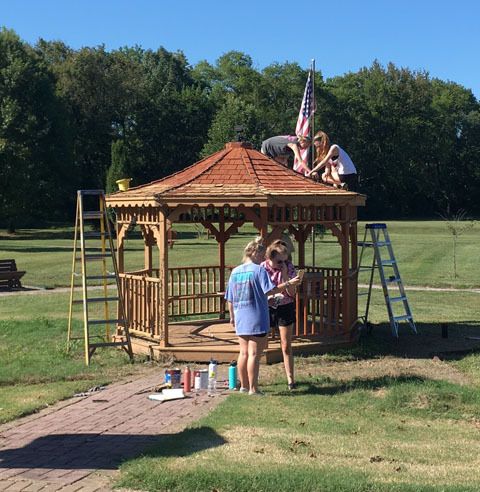 Eagle Scout Candidate Bradlee Watson from Troop 137 in Nolensville recently pressure washed and painted the gazebo at the Sensory Garden for the Blind as part of his Eagle Scout project. On June 23rd, District 12-I Governor Elect Phil Barnes installed the 2016-17 Officers and Directors for Williamson County Lions Club. 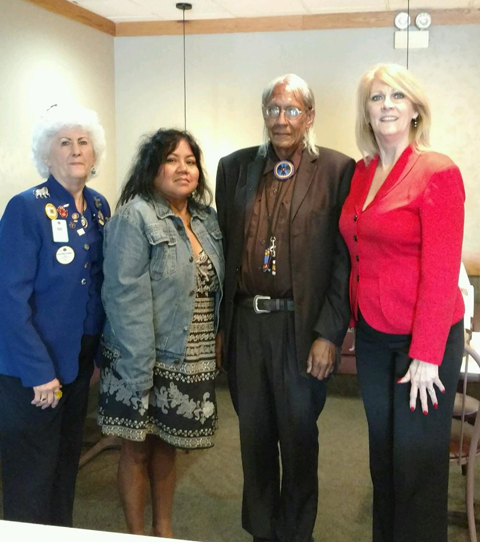 Our Guest Speaker Al Bender along with his wife Melanie and club members Marjorie Crowell and Diane Crowell Adams at our club meeting on May 26th. 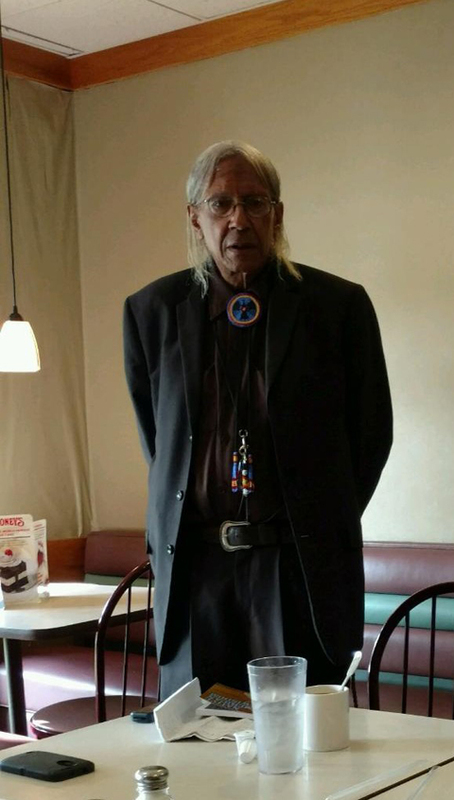 Our Guest Speaker on May 26th was author Al Bender who spoke to our club about the history of the Cherokee Indians and two upcoming annual Pow Wows. 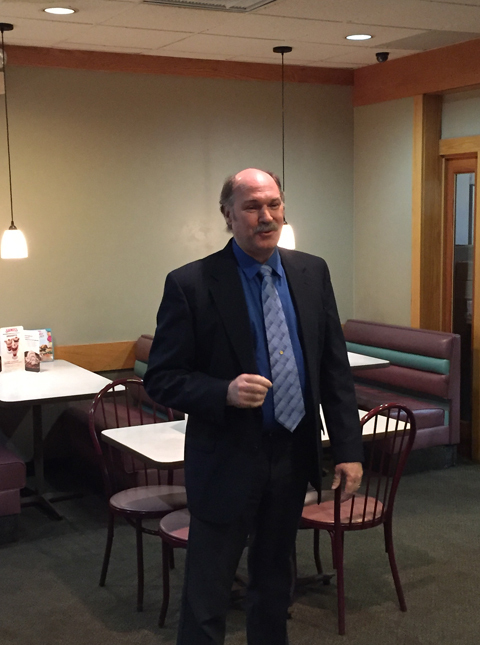 Our Guest Speaker on March 24th was Motivational Speaker and Author Dennis Houchin who spoke to our club about the "ultimate end of failure". 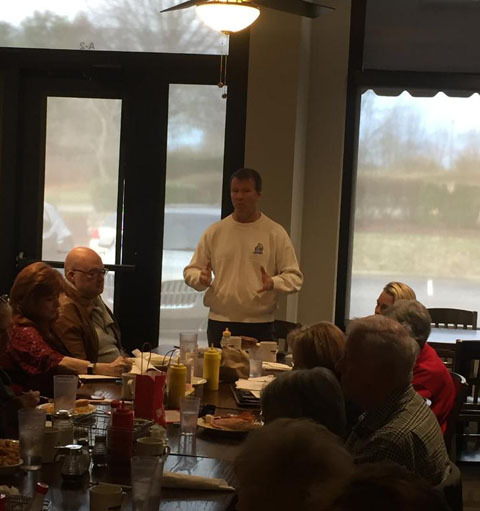 Our Guest Speaker on March 10th was Dr. Matt Harris from Berry Farms Chiropractic in Franklin, TN. Williamson County Lions Diane Adams and Marjorie Crowell present a check to Tinsley Parrish for her winning entry to represent Williamson County Lions Club in the 2015 Peace Poster contest. 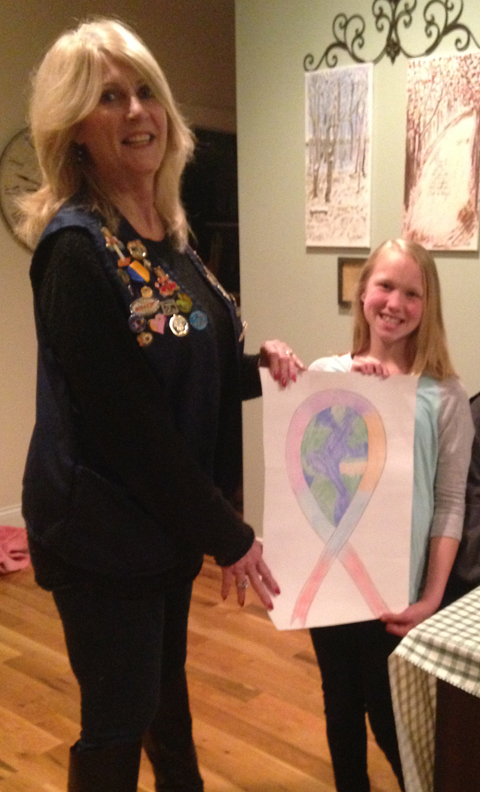 2015 Peace Poster contest winner for Williamson County Lions Club is Tinsley Parrish showing her entry to Lion Diane Adams. 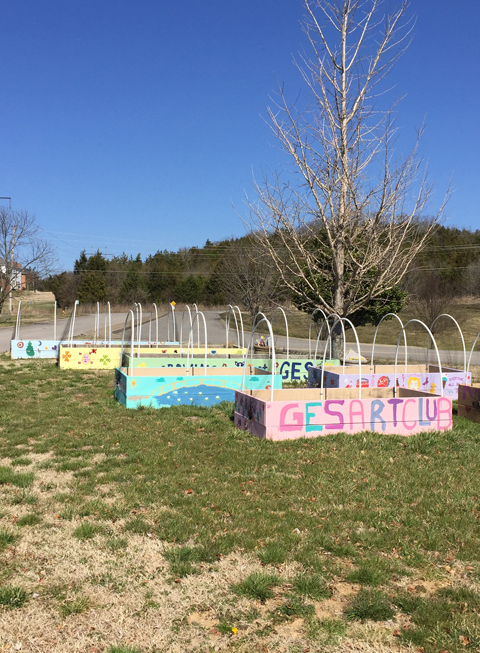 Eagle Scout Candidate Ben Wuller from Troop 130 cleaned out all the raised garden beds, refilled with dirt and installed protective covers for each one of the beds at Grassland Elementary School. 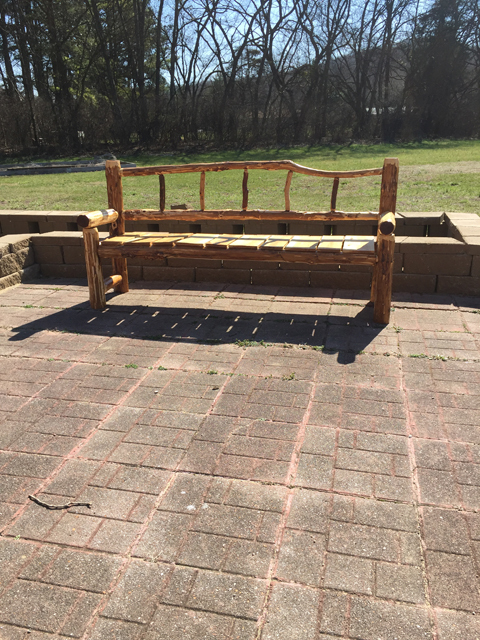 Eagle Scout Candidate Ethan Curl from Troop 130 built two six foot cedar benches for the Imagination Discovery Garden at Sensory Garden for the Blind. 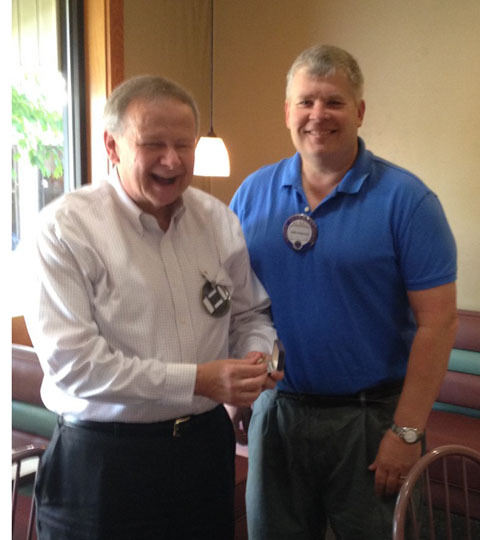 New member David Lee Buselmeier was inducted at our club meeting on February 11th by PDG Thom Wilson. 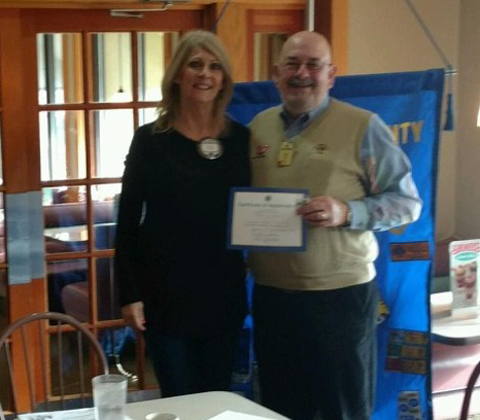 Our Guest Speaker on February 11th was PDG Thom Wilson shown here with Program Chair Diane Crowell Adams. 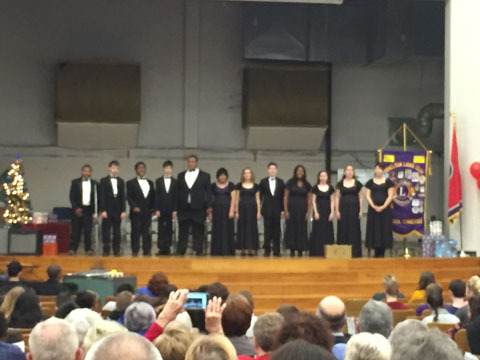 Some of our members attended the Tennessee School for the Blind Lions Day Christmas Program. Our Guest Speaker on August 27th was Motivational Speaker Gina Parris. 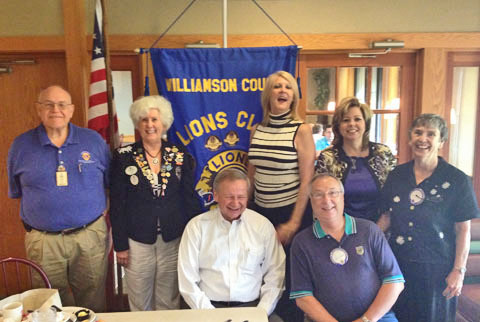 Council Chair Ron Anderson Installed the 2015-2016 Officers and Directors for Williamson County Lions Club. 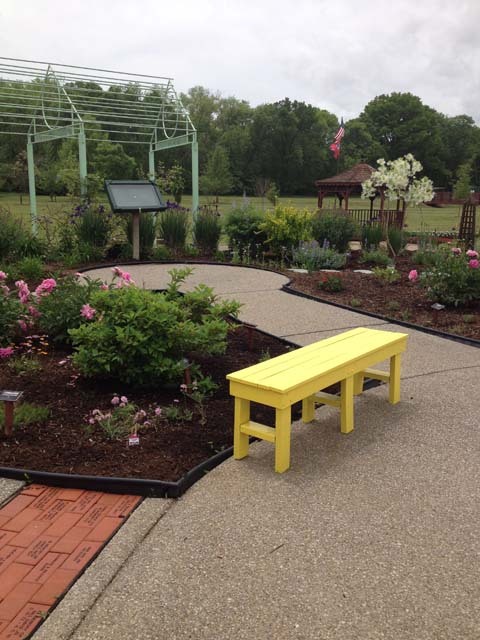 Before leaving Middle Tennessee, Beat and Angela Hiestand from Zurich Switzerland, paid a visit to the Sensory Garden for the Blind in Grassland. 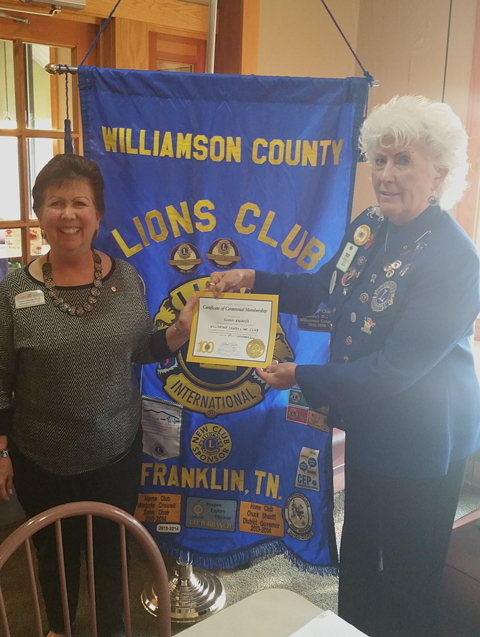 Zurich-Altstadt Lions Beat and Angela Hiestand with Williamson County Lion Marjorie Crowell. Immediate Past President Mike Anderson presents President Chuck Wells with the Chuck Sheriff Lion Ring at the end of his current term. 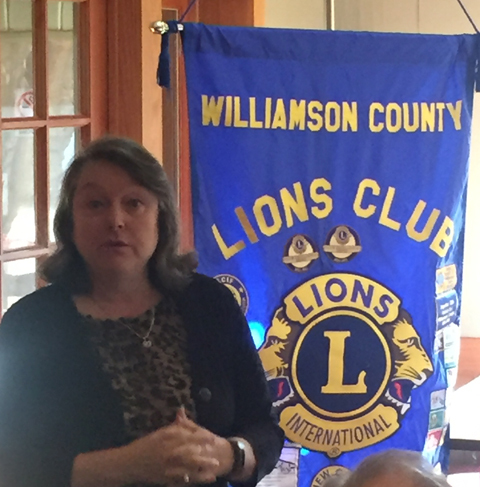 Our Guest Speaker on May 28th was Sarah Mickle who spoke to our club about Davis House which is a Child Advocacy Center serving Williamson, Hickman, Lewis and Perry County. 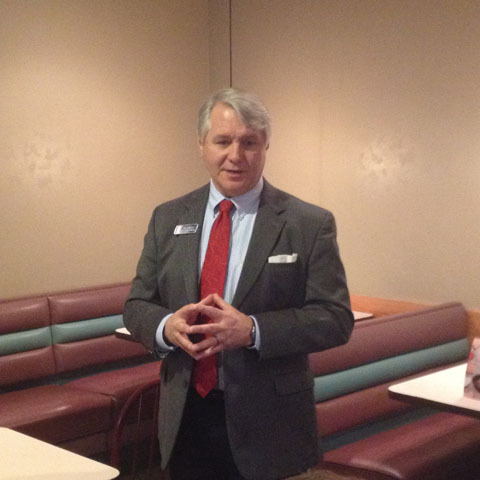 Our guest speaker on February 12th was Jim Furbush from the Better Business Bureau of Middle Tennessee. 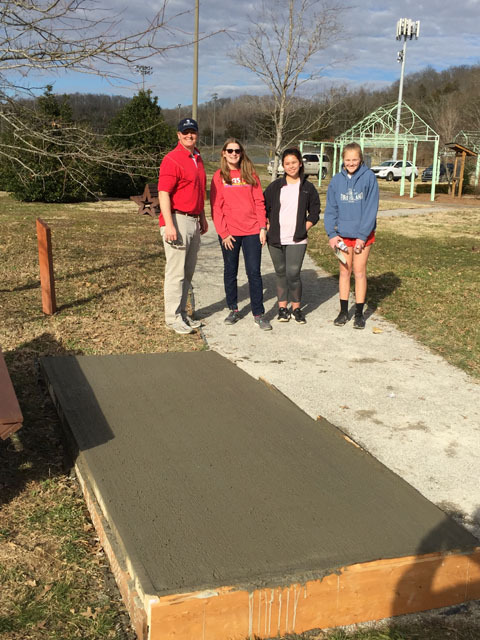 Scout Matt Voyles (center) who built stone flowerbeds at the Sensory Garden for the Blind as his project, became an Eagle Scout for Troop 130 at a ceremony on February 1st. 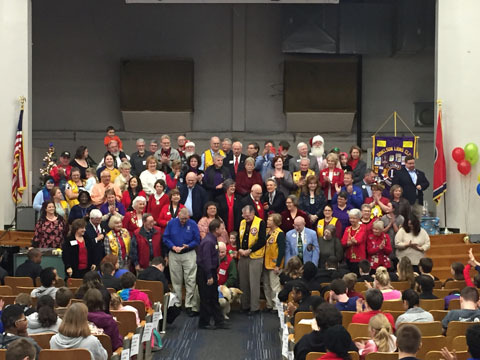 On December 12th, 5 members from Williamson County Lions Club attended the Lion Day Program at Tennessee School for the Blind. 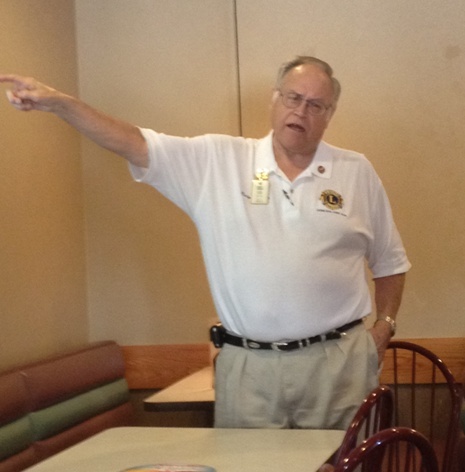 District Governor Ron Anderson spoke to our club about current issues and upcoming events for Lions in Middle Tennessee. 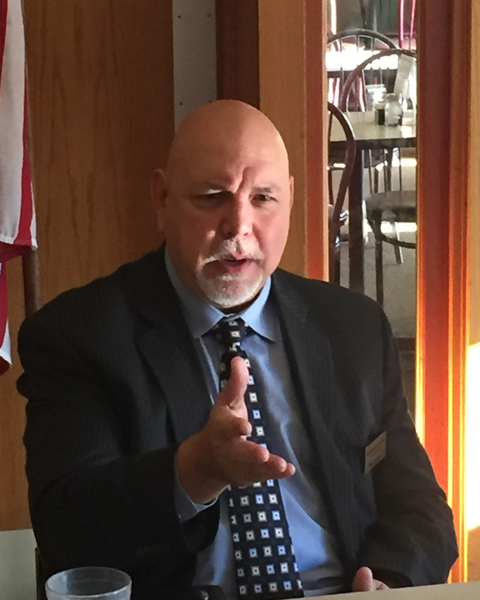 Our Guest Speaker on December 11 was Michael Sigmon from New Castle Mortgage to talk to our club about Reverse Mortgages. 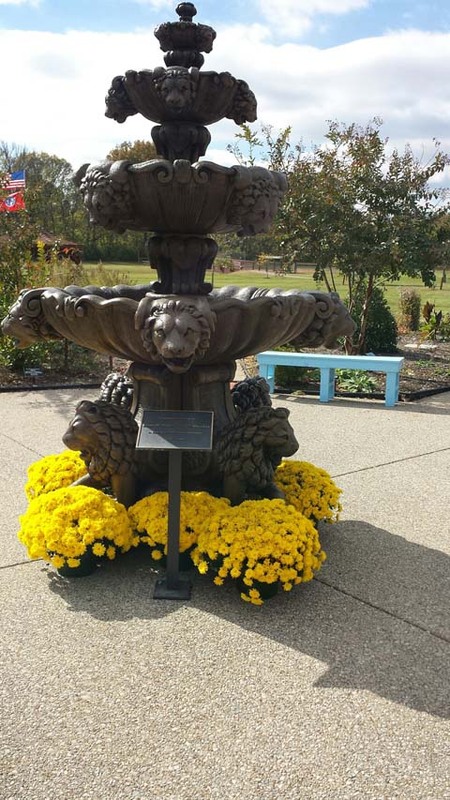 A recent photo of the Lion Fountain at the Sensory Garden for the Blind. 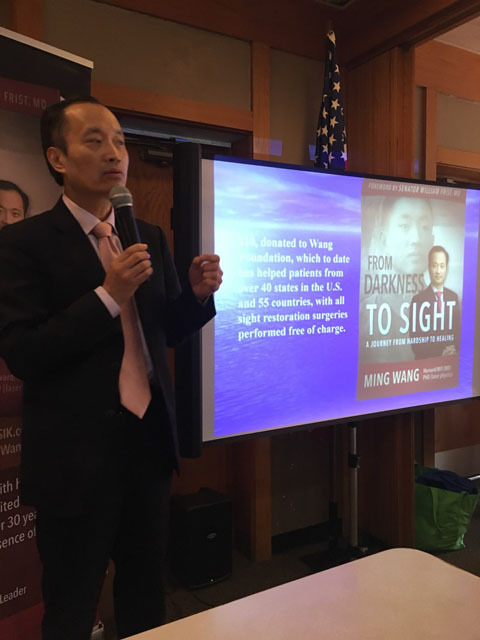 On October 23rd, our guest speaker was Dr. James Loden from Loden Vision Centers. 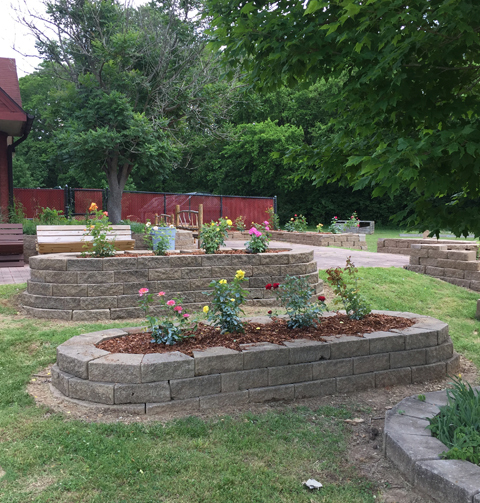 Eagle Scout Candidate Matthew Voyles from Troop 130 led the construction project of this Tiered Garden at Sensory Garden for the Blind. 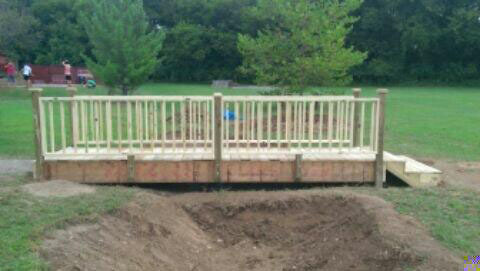 Eagle Scout Candidate Joey Rosen from Troop 13 led the construction project of this bridge at Sensory Garden for the Blind. 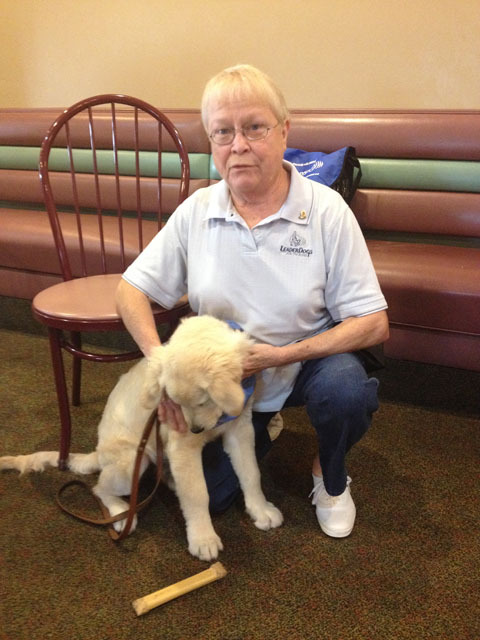 Lion Elaine Berkheiser and Leto who is a Leader Dog for the Blind in training. 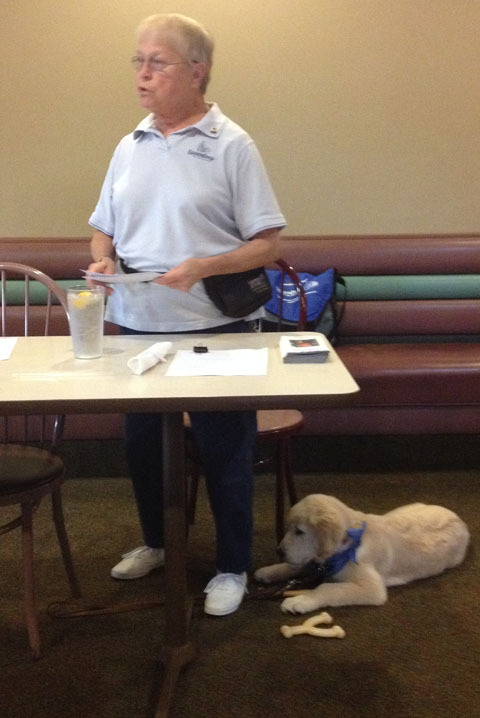 Our Guest Speaker on August 28th was Lion Elaine Berkheiser who talked to our club about Leader Dogs for the Blind. 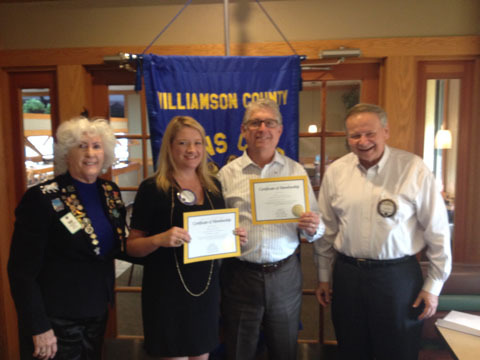 New members Becky Pollock and David Wilbanks were inducted into Williamson County Lions Club with Zone Chair Marjorie Crowell and President Chuck Wells looking on. Our Guest Speaker on July 24th was Todd McKee who is the founder of Tool Life which is a nonprofit that provides tools throughout the world to those in need. 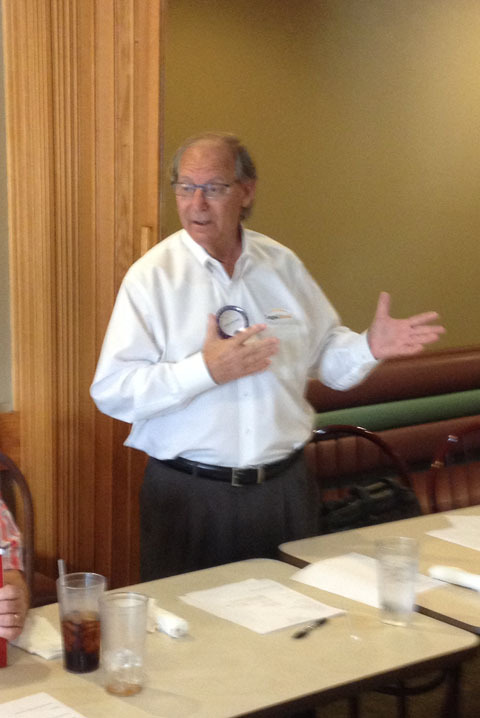 Our guest speaker on June 26th was Lion Larry Schulman who spoke to our club about identity theft prevention. Our 2014-15 Club Officers were installed by Past District Governor Ralph Brewer. Lion Marjorie Crowell was presented an International Presidential Certificate of Appreciation from Past District Governor Ralph Brewer. Lion Chuck Wells was presented an International Presidential Certificate of Appreciation from Past District Governor Ralph Brewer. 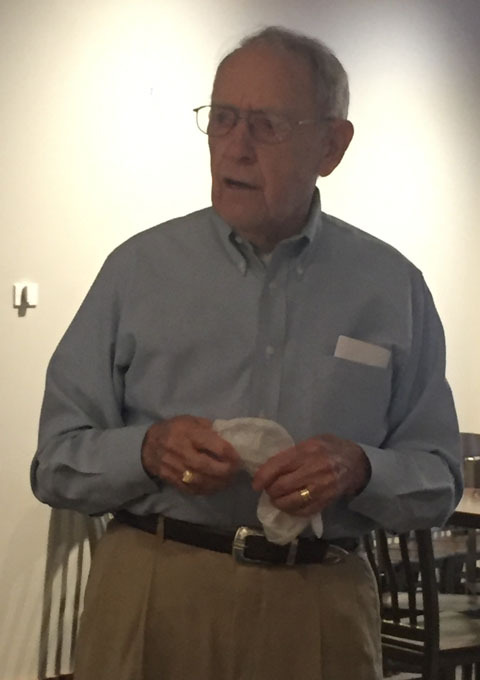 Our guest speaker on June 12 was Past District Governor Ralph Brewer who spoke to our club about the Tennessee School for the Blind and Installed our new officers. 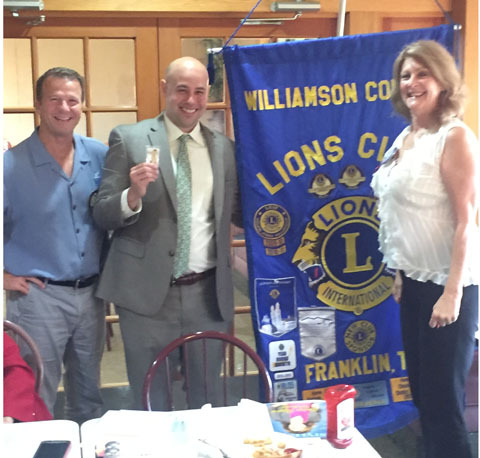 Our Guest Speaker on May 22 was Matt Largin who is President of Williamson County Chamber of Commerce. 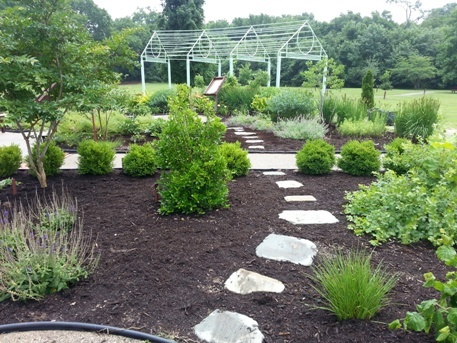 Recent photo from Sensory Garden for the Blind. 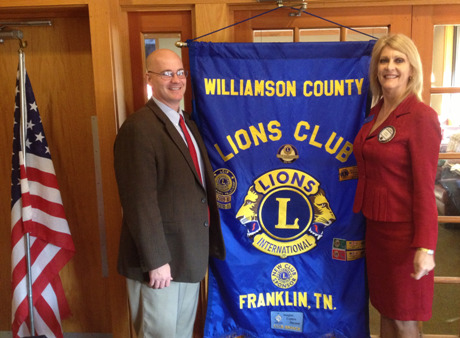 New Lion Robert Taylor was inducted into Williamson County Lions Club with sponsor Lion Chuck Wells. 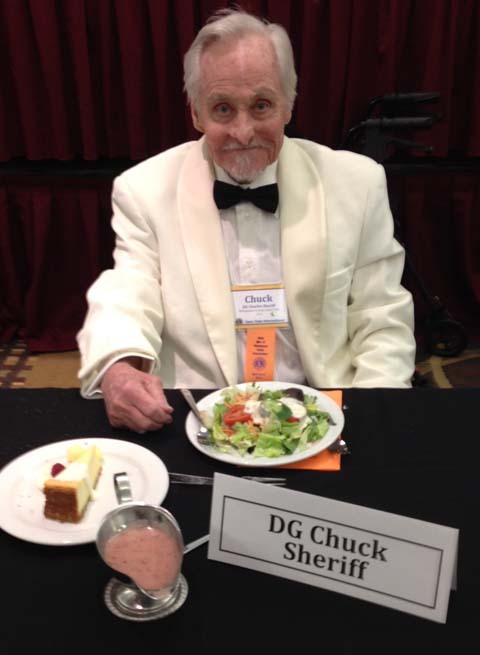 District Governor Chuck Sheriff while at the MD-12 Convention Banquet held in Memphis. 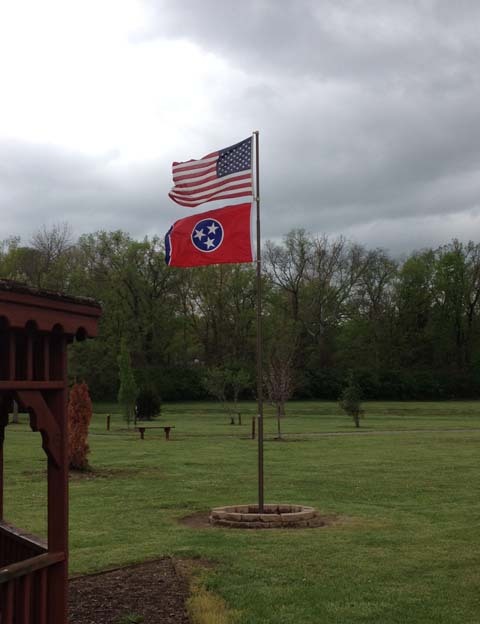 The flagpole at Sensory Garden for the Blind was recently installed by Lions John Phillips and Chuck Wells. 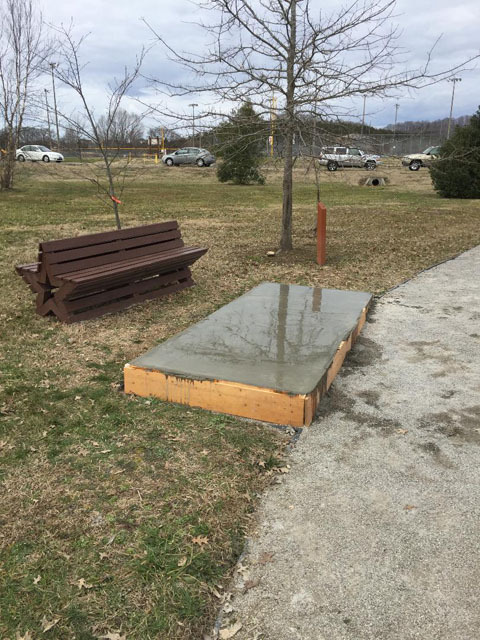 Our Guest Speaker on April 24th was Lea Hudson who along with Marilyn Bazzell talked to our club about The Mary Lynn Foundation which builds ramps for people in need. 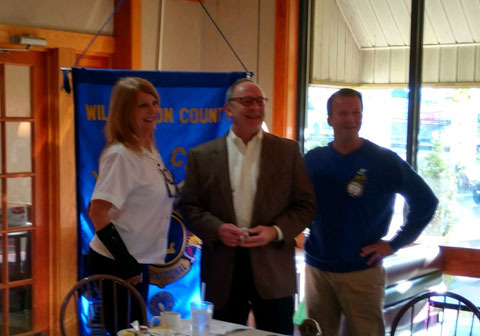 New Members Randy Crowell and Ashlee Dobbs are shown along with Zone Chair Marjorie Crowell and District Governor Chuck Sheriff following their induction ceremony to join Williamson County Lions Club. 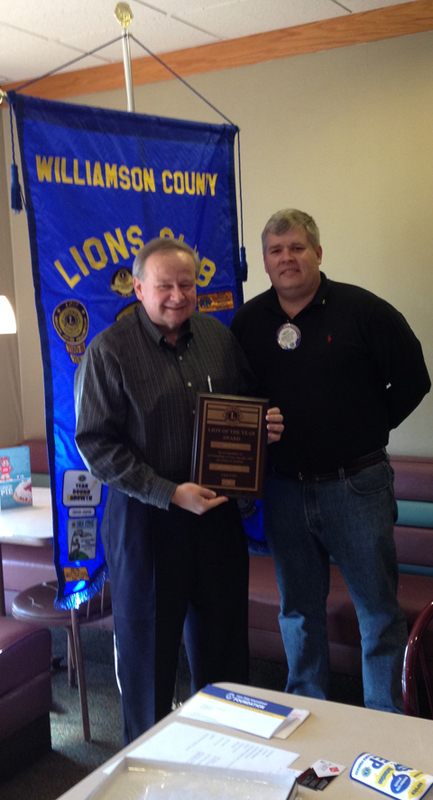 Lion Chuck Wells was presented a 2013 Lion of the Year Award for Williamson County Lions Club by Club President Mike Anderson. 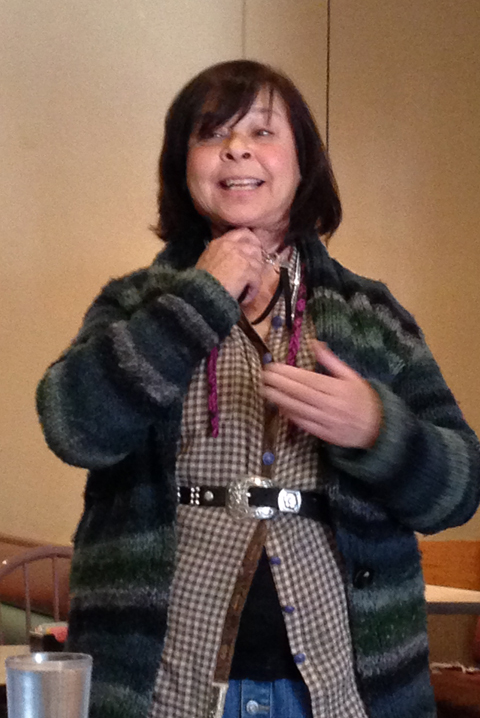 Our Guest Speaker on February 27th was Angela Good who spoke to our club about Christian Women' Job Corp (CWJC). Lion Marjorie Crowell was recognized for her work as Zone Chairperson by Lion International Director Mike Molenda at the District 12-I Convention. 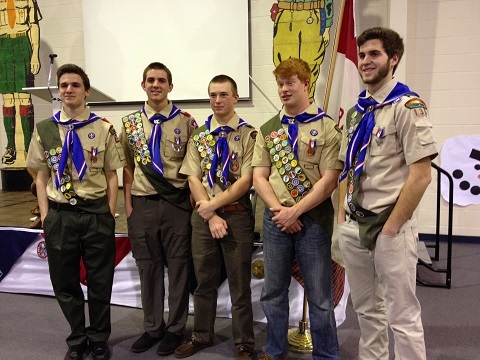 Eagle Scout David White with other new Eagle Scouts at their ceremony on February 2nd. 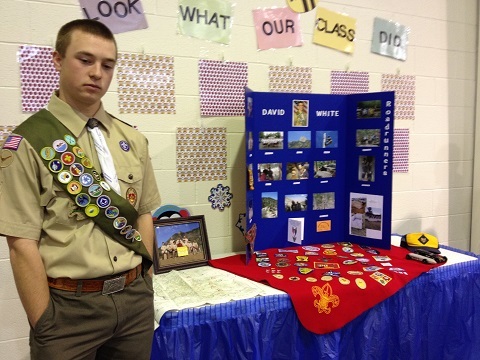 Boy Scout David White achieved the rank of Eagle Scout at a Ceremony on February 2nd. 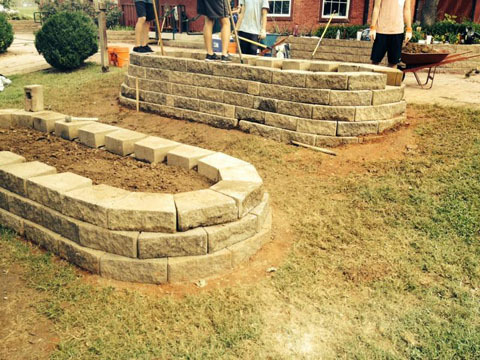 David worked with Williamson County Lions Club to build garden planter boxes for Grassland Elementary School. 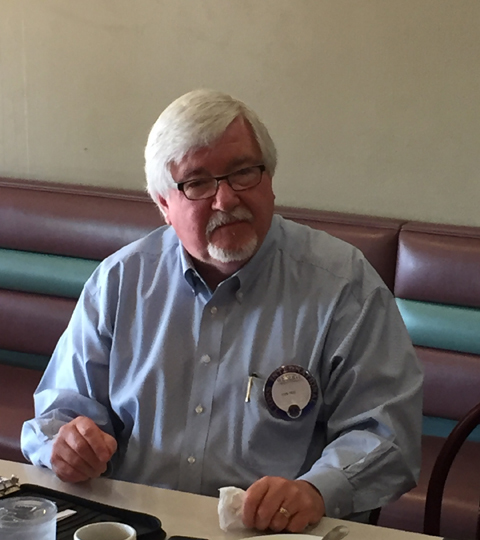 Our Guest Speaker on January 23rd was Lion Pat Waggoner who talked to our club about the Job Seeker Program he has created. Our club's entry for the Lion Learning Retreat 2014 Basket Contest that is filled with baked goods made by our members from our club. Ana Rae Lambert who was our clubs entry for the 2013 Peace Poster Contest receives a certificate and award from District Governor Chuck Sheriff. 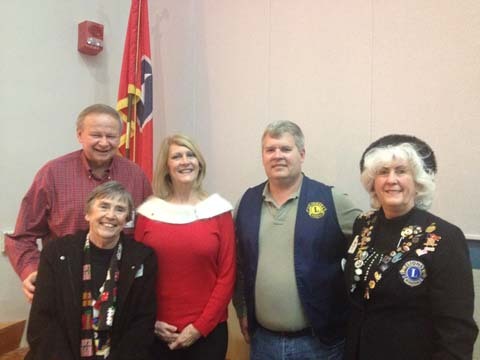 Willimson County Lions Club Members Mary Ann Calahan, Marjorie Crowell and Mike Anderson attended the Tennessee School for the Blind Christmas Program for the Lions of Tennessee. 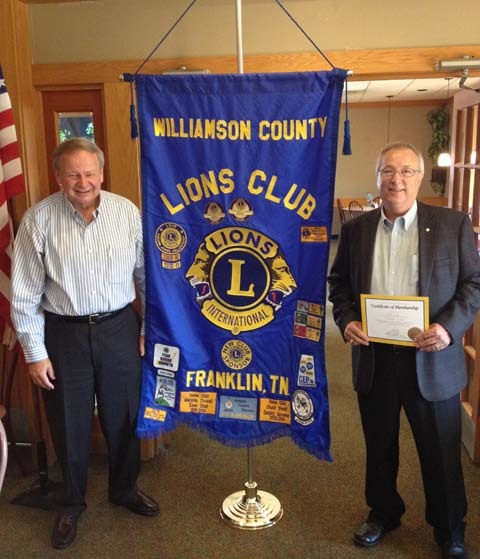 Congratulations to Chuck Wells who was voted as the Lion of the Year for Williamson County Lions Club. New Member Larry Schulman being congratulated by District Governor Chuck Sheriff and his sponsor Lion Chuck Wells watching the Induction Ceremony. 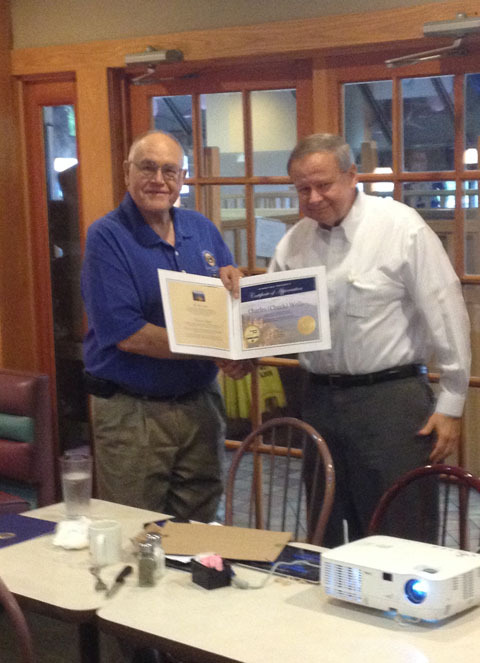 New Lion Larry Schulman was inducted into our club by District Governor Chuck Sheriff. Our Club presented Pam Wilsford who has been our waitress for our meetings for the last four years with a Christmas Card and a small token of our appreciation. We had a Christmas Party Dinner at Shogun Restaurant. 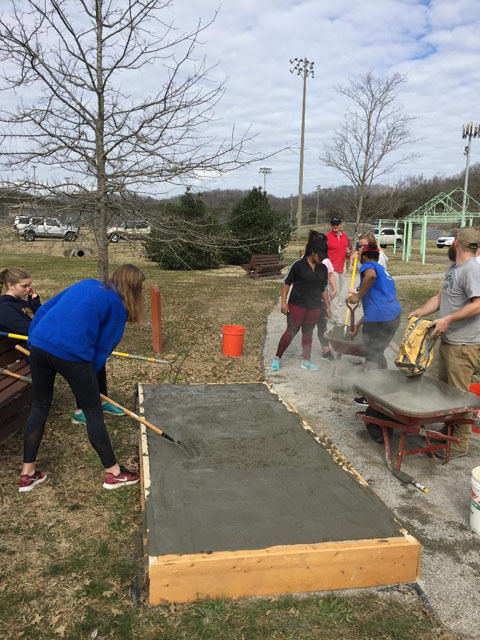 Troop 130 Berrys Chapel working on an Eagle Scout project for Boy Scout David White by building more vegetable planter boxes at Grassland Elementary School. 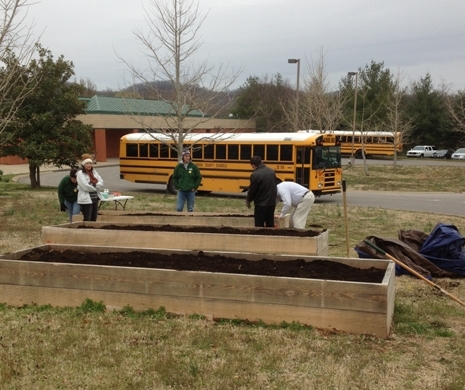 Boy Scouts from Troop 130 Berrys Chapel building vegetable planter boxes at Grassland Elementary School. 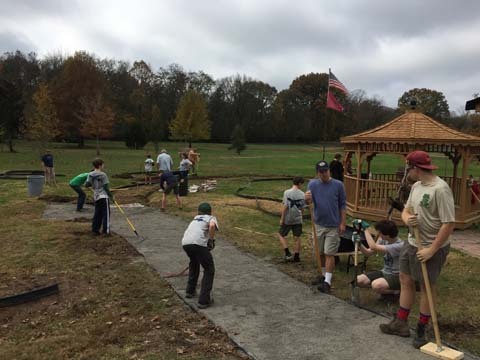 Boy Scouts from Troop 130 Berrys Chapel working on an Eagle Scout Project by building more vegetable planter boxes at Grassland Elementary School. Our new Club Banner on display at the Wild Game Feast. Some or our crew preparing for the Wild Game Feast Fundraiser. Some of the people who attended and enjoyed our Wild Game Fundraiser. The serving line at our Wild Game Feast Fundraiser. The cooks preparing the food for our Wild Game Feast Fundraiser. Some of the Lion Club Volunteers watching Casey enjoy his spaghetti. Lion Becky and Honorary Lion Bill cooking spaghetti. Lions Chuck, Debbie and Marjorie serving spaghetti. Lions Casey and Mary Ann selling tickets. The flyer for our Spaghetti Dinner Fundraiser. Our Guest Speaker on October 24th was Terry Humphrey who spoke to our club about using conversation to reduce workplace drama. 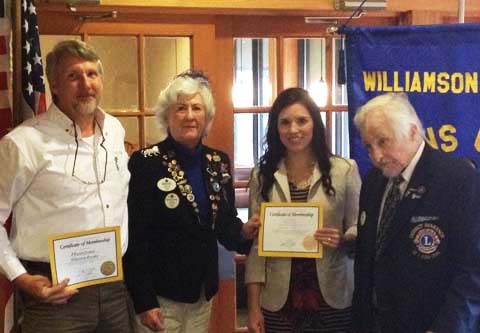 New Member Emily Pugh was inducted into our club by District Governor Chuck Sheriff and sponsored by Lion John Miller. 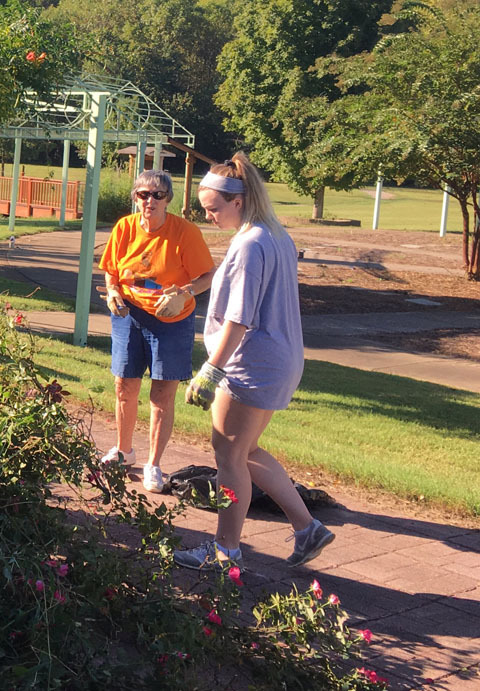 Page High School Student Marina Dunn received the Lion Young Leader Service Award from Club President Mike Anderson for her volunteer service over the past year. 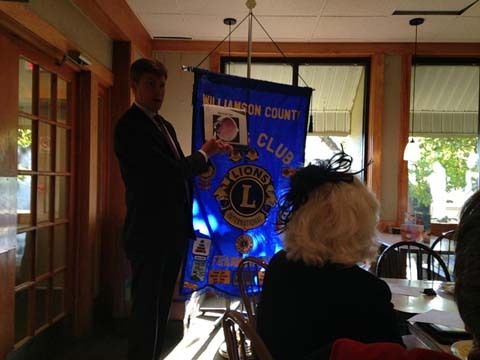 Our Guest Speaker on September 26th was Dr Mike Looney, Superintendent for Williamson County School. New Lion Dave Webber along with his sponsor Lion Chuck Wells. 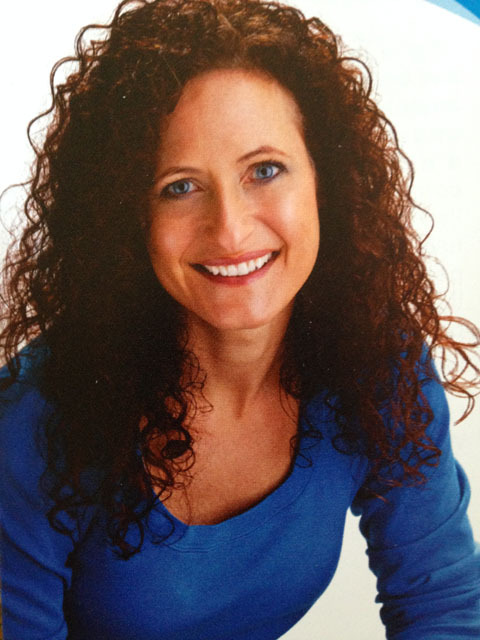 Our Guest Speaker on August 22nd was Amy Carver, who is the Development Director for Interfaith Dental Clinic. Lion Chuck Wells sponsored New Lions Tracy Hill, Ginger Farmer and Amy Smith. District Governor Chuck Sheriff led the Induction Ceremony. 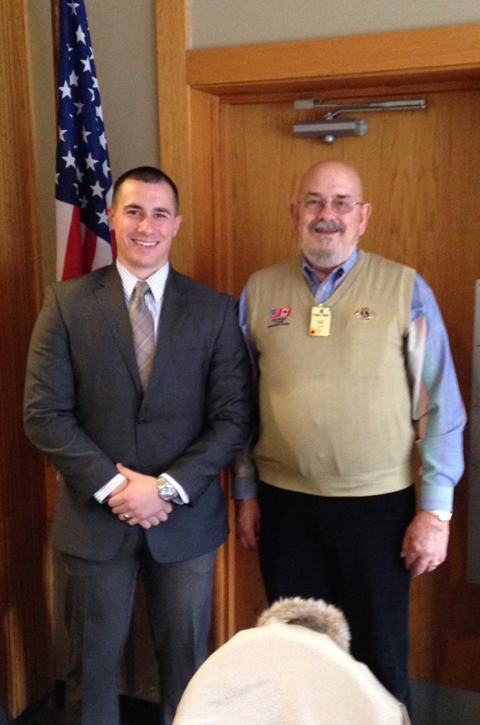 Lion Casey Cavanah was installed as the 2nd Vice President by District Governor Chuck Sheriff. 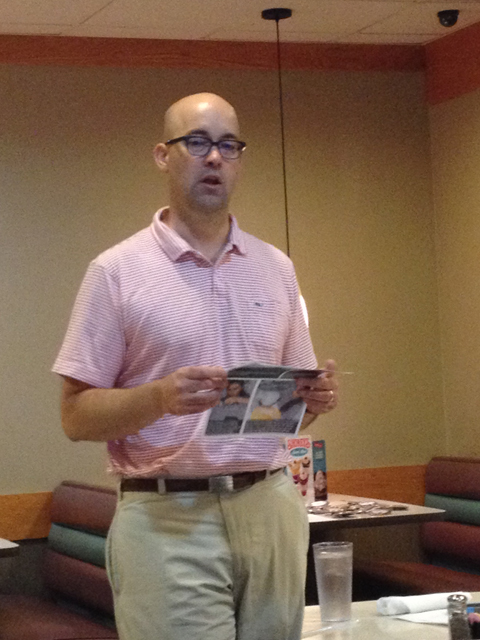 Our Guest Speaker on August 8th was Jack Lunn who spoke about how to "Jack up you creative selling". 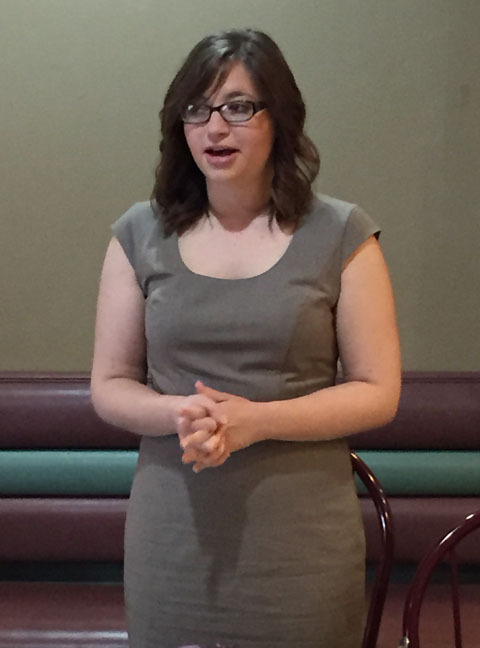 Our Guest Speaker on July 25th was Michelle Metzger who spoke to our club about the Smart911 Program. Our Guest Speaker on July 11th was Dr. Jeff Yates from Peak Performance Chiropractic who spoke about "Back to basics to prevent back pain." 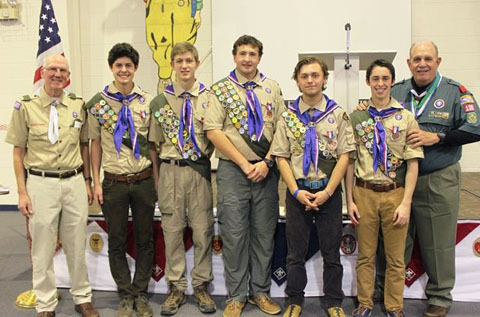 New Officers for 2013-2014 were installed on June 27th. 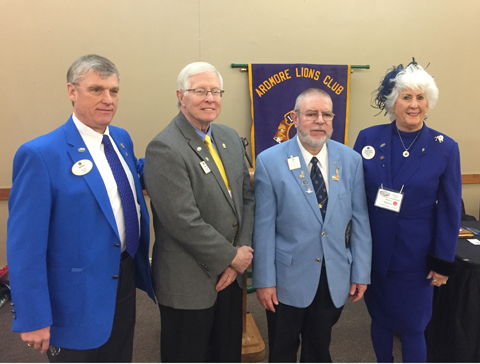 Those present were Lion Chuck Wells (Treasurer and 1st Vice President), Lion Mike Anderson (President), Lion Marjorie Crowell (Secretary and Tail Twister), and Lion Chuck Neighbors (Membership Chair and Immediate Past President). Lion Chuck Wells being presented an award by District Governor Chuck Sheriff for sponsoring multiple new members. 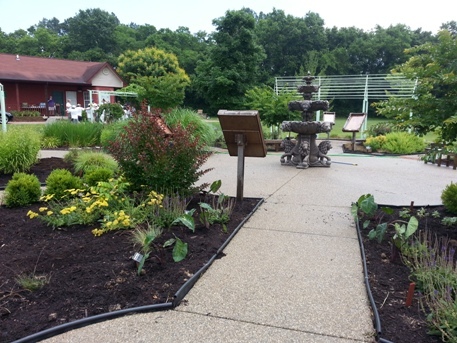 Recent photo of Sensory Garden for the Blind after a workday on June 21st. 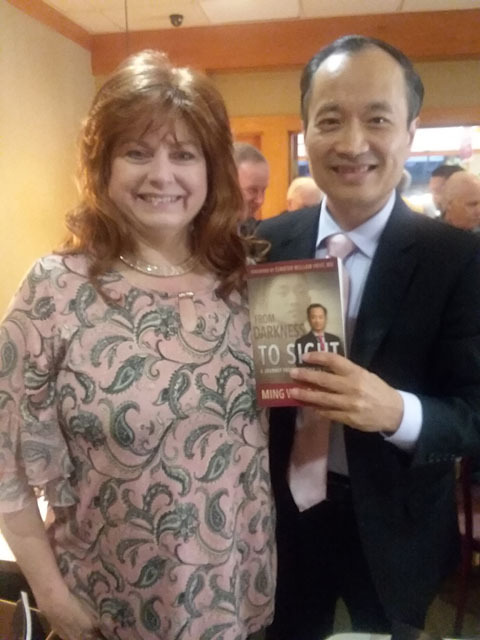 Our Guest Speaker on May23rd was Private Investigator Sheila Wysocki. 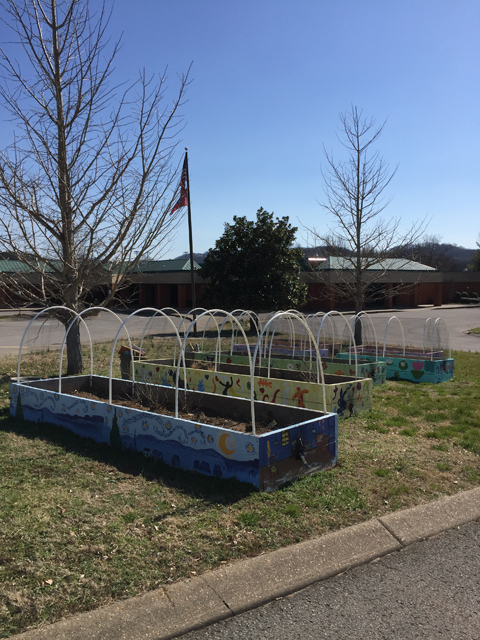 Recent photo of the Grassland Elementary School Garden Project. Newly Inducted Lion Pat Waggoner along with his sponsors Lion Chuck Neighbors and Casey Cavanah with District Governor Elect Chuck Sheriff looking on. New Member Pat Waggoner being inducted by District Governor Elect Chuck Sheriff. 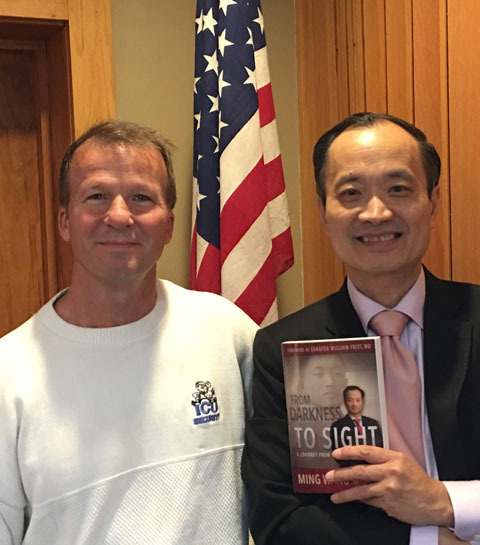 Our Guest Speaker was Tom Lawrence who is President and General Manager for WAKM Radio Station who talked to our club about China and his travels to that country. 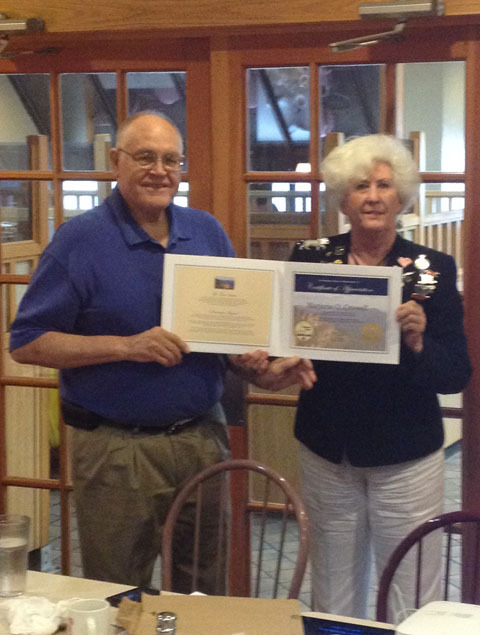 Lion Chuck Wells being presented his Order of the Golden Chain Award by Lion Zone Chair Marjorie Crowell. Lion Chuck Wells received the Order of Golden Chain Award at the MD-12 Convention. 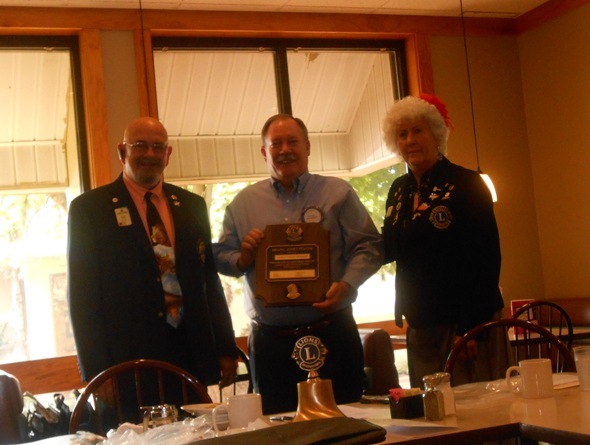 Club President Chuck Neighbors displays the Gold Club Award during our recent club meeting. 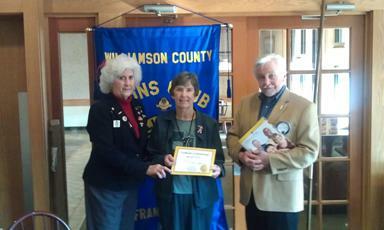 Williamson County Lions Club was recognized as a Gold Club at the MD-12 State Convention for 2012-2013. Lion Marjorie Crowell's Certificate of Appreciation presented at the MD-12 State Convention. Lion Marjorie Crowell was awarded a Certificate of Appreciation by District Governor Mark Cook at the MD-12 State Convention. 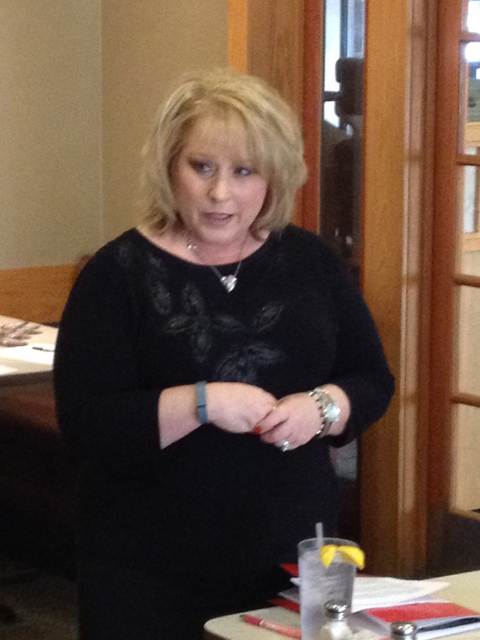 Our Guest Speaker on April 25th was Debbie Henry with the TMA Group. 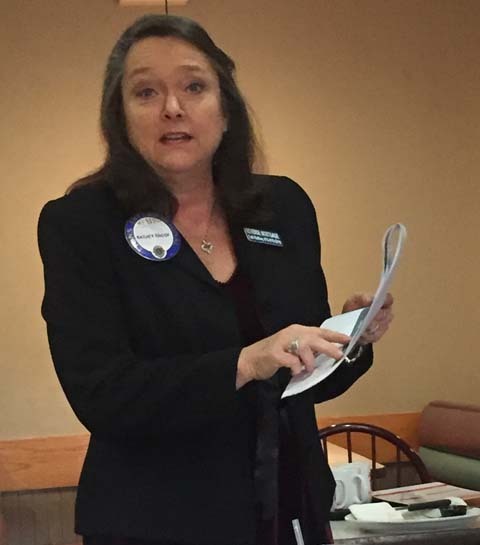 She spoke to us about Public Transit in Franklin and Cool Springs. 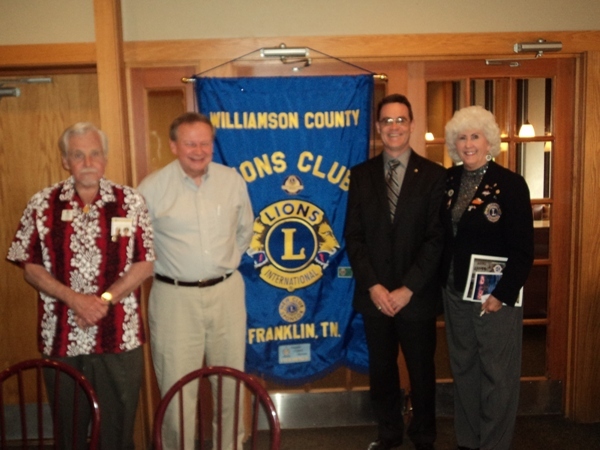 Williamson County Trustee and Franklin Lion Club Member Joey Davis was our Guest Speaker at our Membership Meeting. We had a great turnout for our Membership Meeting. New Williamson County Lion Club Members Casey Cavanah and John Miller. 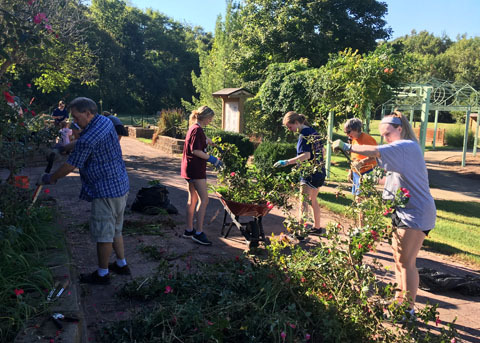 Williamson County Lion Club Members work on the trellis and wind chimes at the Sensory Garden for the Blind in Grassland. 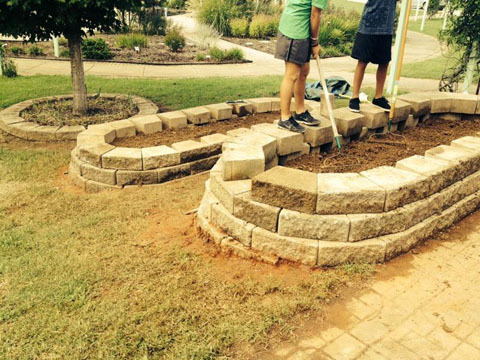 Williamson County Lions Club Members, Master Gardeners and Local Girl Scouts work in the Sensory Garden for the Blind. 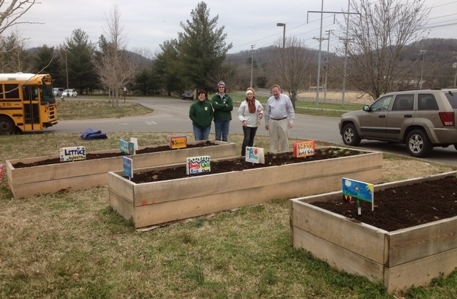 Lions Chuck Wells and Becky Mason along with Grassland Elementary PTO Members by the completed vegetable planters. 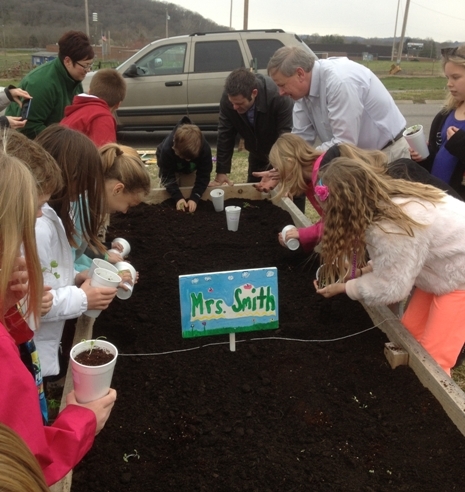 Lion Chuck Wells assisting Grassland Elementary Students plant their vegetables while Lions John Miller and Becky Mason look on. 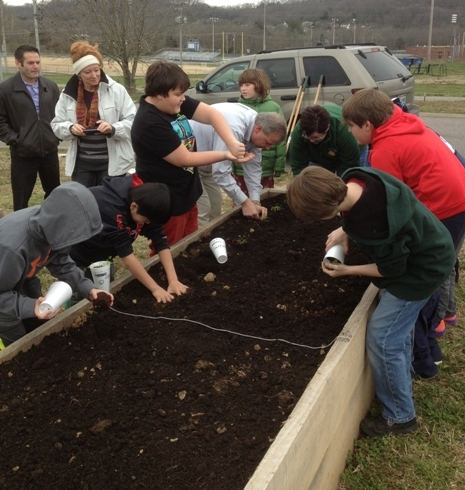 Lions John Miller and Chuck Wells assist Grassland Elementary Students plant their vegetables. 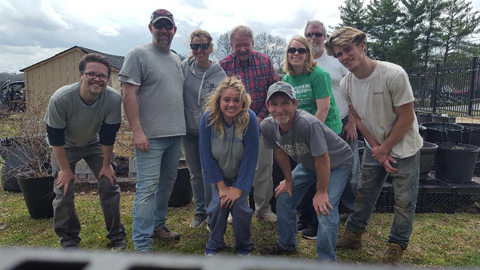 Williamson County Lions Club Members and Grassland Elementary School PTO Members prepare vegetable planting beds for students. Newly Elected District 12-I Governor Chuck Sheriff with Lion Diane Crowell Adams at the District Convention. Newly Elected District 12-I Governor Chuck Sheriff addressing the District Convention at Montgomery Bell State Park after the election. New Williamson County Lion Club Member Joe Garrisi being inducted by WCLC President Chuck Neighbors and Lion Chuck Wells. 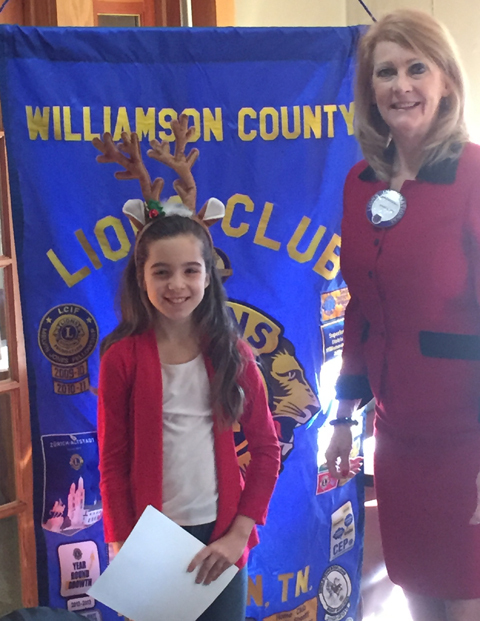 Jordynn Placentia being presented with an award from Williamson County Lions Club for her submission in the Peace Poster Contest. Pictured with Jordynn are Lions Chuck Wells, Becky Mason and President Chuck Neighbors. Lions Marjorie Crowell and Martha Neal were two of the members from our club to attend the Tennessee School for the Blind Christmas Program on December 14th. Our Guest Speaker on Novemember 8th was Matt Throckmorton who is the Executive Director for the Tennessee Charter School Association. 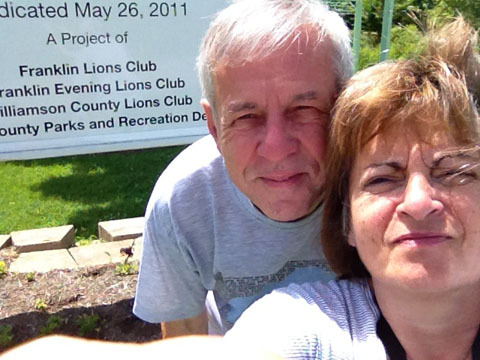 He is seen here with Lion Diane Crowell Adams. 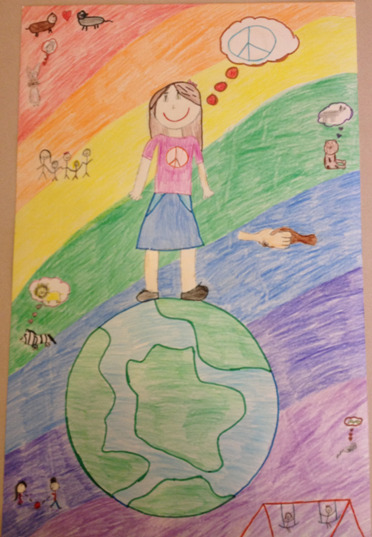 The winning entry for our club's submission to the Lions Club Peace Poster Contest was completed by Jordynn Placentia from Page Middle School. 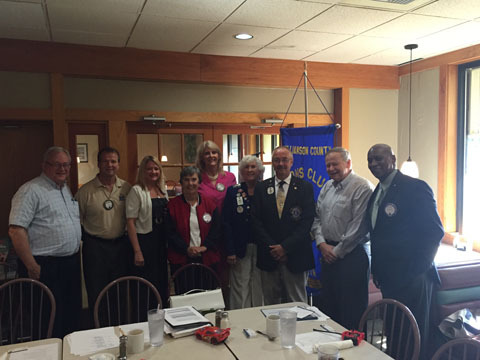 Our Guest Speaker on October 25th was District Governor Mark Cook. Our newest member Becky Mason during her Induction Ceremony being led by Lion Chuck Sheriff. 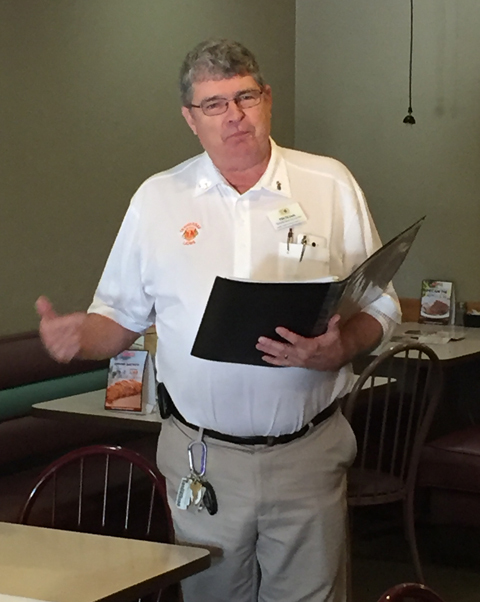 Our guest speaker on August 23rd was Past District Governor Ralph Brewer who gave a presentation to our club about the Tennessee School for the Blind. 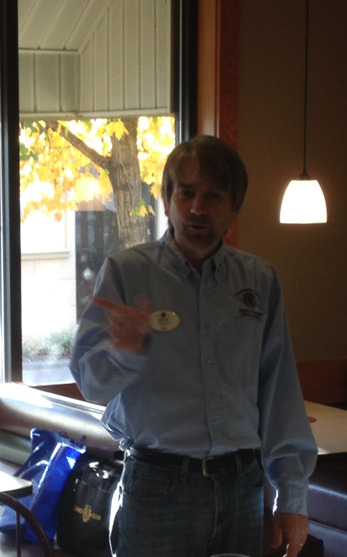 Our Guest Speaker on August 9th was Gordon Hampton who is with The Williamson County Parks and Recreation Department. 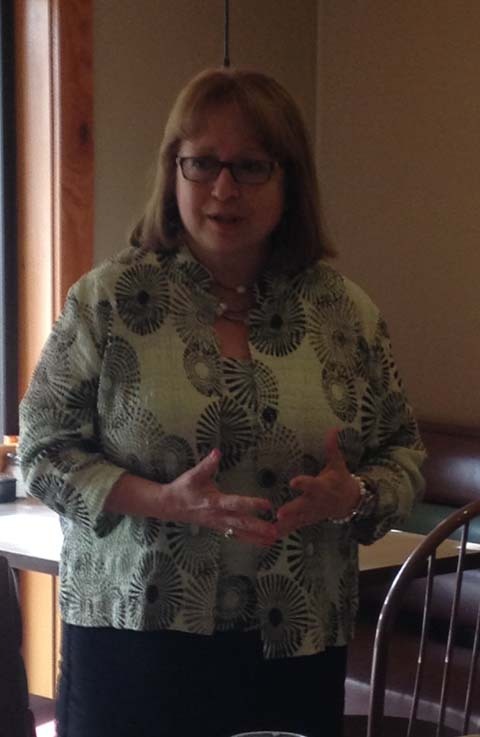 Our Guest Speaker on July 12th was Brenda Hauk from Brightstone. Wells; Secretary, Charles (Chuck) Sheriff, and Membership Chair, Diane Crowell Adams. Lion Chuck Neighbors was awarded a Melvin Jones Fellow Service Award by Past District Governor Thom Wilson and Club President Marjorie Crowell. 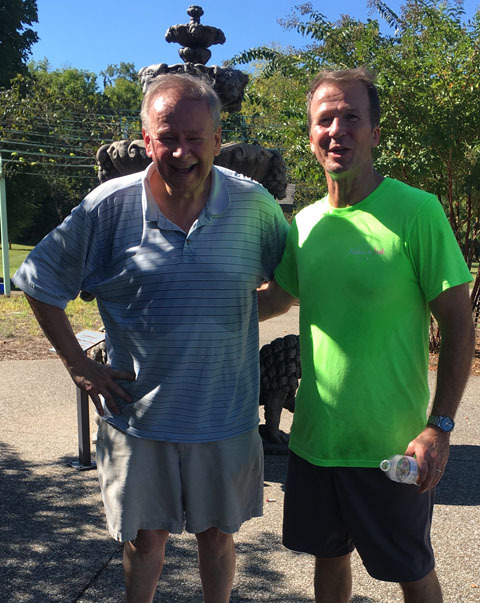 Lions Chuck Neighbors, Chuck Wells and Mike Anderson at the Sensory Garden for the Blind. 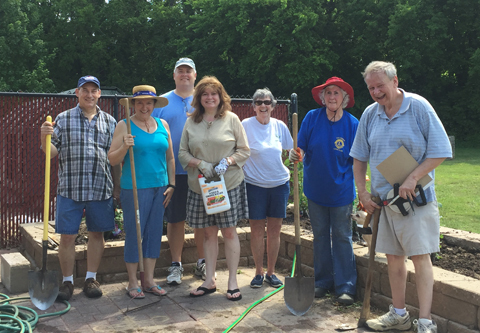 Lions Club Members working at the Sensory Garden for the Blind. 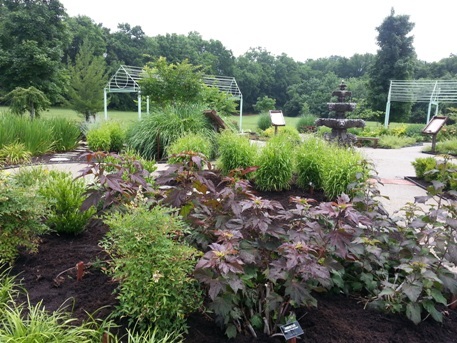 Lion Mary Ann Calahan working on a display case at the Sensory Garden for the Blind. New Member Mark Smith with Immediate Past President Chuck Sheriff, President Marjorie Crowell and Lion Chuck Wells. Mark Smith being Inducted as a Lion by Immediate Past President Chuck Sheriff with Lion Chuck Wells looking on. Diane Crowell Adams receives the Melvin Jones Fellow Service Award presented by PDG Thom Willson and Club President Marjorie Crowell. 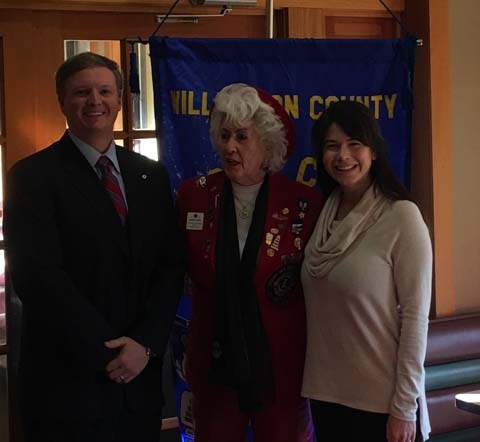 New Williamson County Lions Club Member Mary Ann Calahan along with President Marjorie Crowell and Immediate Past President Chuck Sheriff. 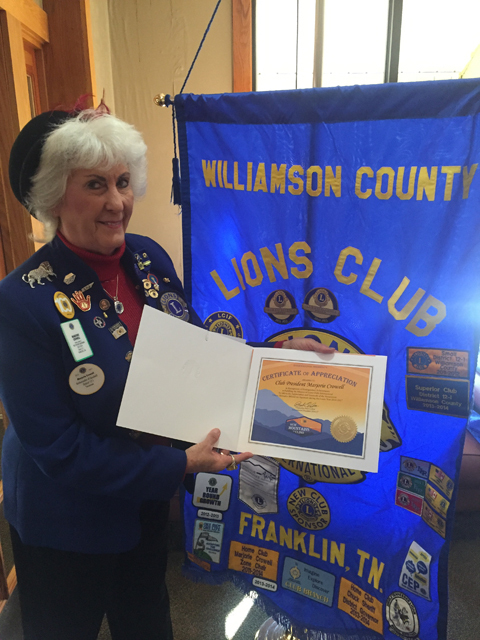 Marjorie Crowell, President of the Williamson County Lions Club, received two of the Lions Club highest recognitions at the District 12-I Convention. International Director Mark Hintsmann of Wisconsin (R) presents the International Presidents Certificate of Appreciation and Governor Lynn Wright (L) awarded the Certified Guiding Lion designation. Williamson County Lions Club President Marjorie Crowell presents the club banner to the Columbia Lions Club during their charter night ceremony. Robert Cross is a resident at a WAVES home in Franklin. 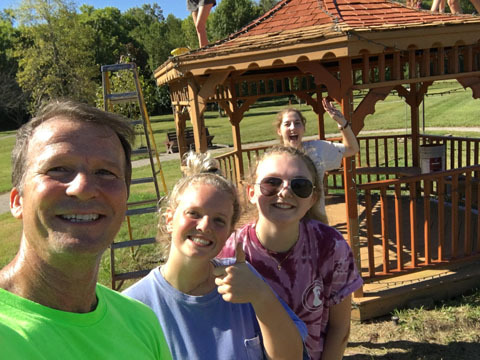 After contacting the Williamson county Lions Club about replacing his glasses that were broken in an accident, he was able to get them through a joint effort of LensCrafters of Franklin and our club. 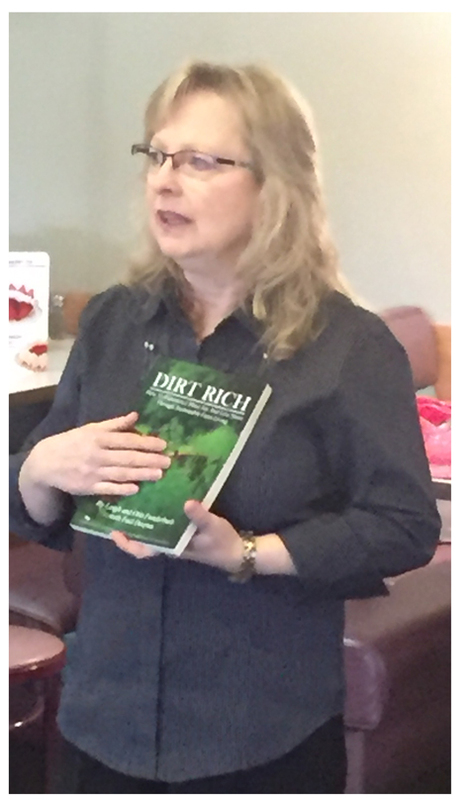 Speaker Barbara Howell gave an interesting report to our club on her life detailed in her book titled "It Ain't Over Til It's Over!" 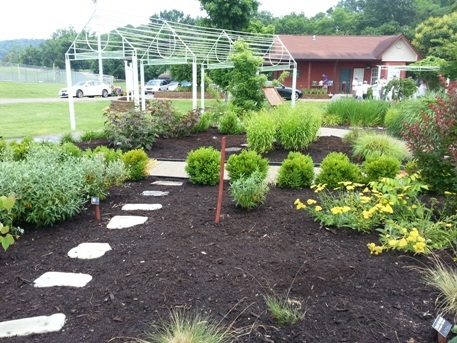 Click here to view photos of the Sensory Garden for the Blind taken by Lion Debra Sheridan. 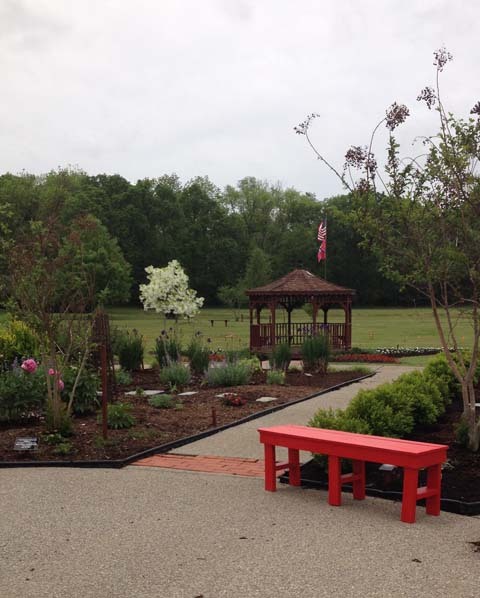 Click here to view photos of the Sensory Garden for the Blind taken by Lion Donna O'Neil. 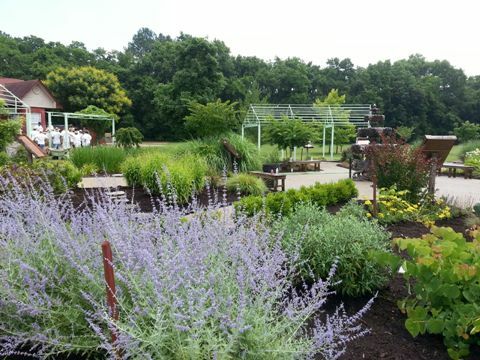 The Tennessee School for the Blind Chorus arrives to perform at the Sensory Garden for the Blind Grand Opening. Chamber of Commerce Board Member Gary Buchanan addresses the audience at the Grand Opening. 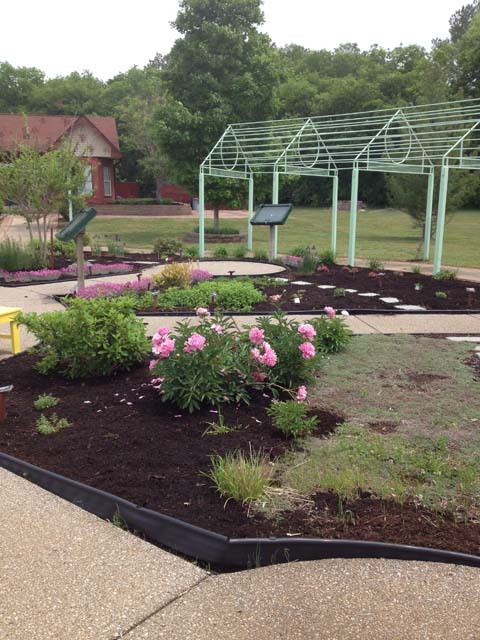 Lions and Master Gardeners prepare for the ribbon cutting at the Sensory Garden for the Blind Grand Opening. 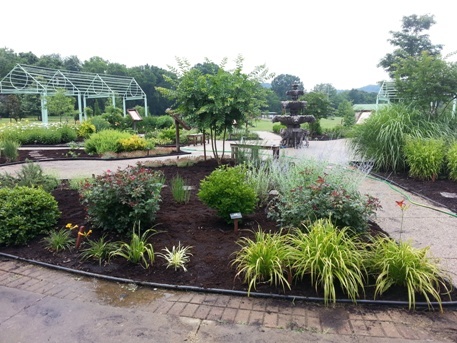 Sensory Garden for the Blind Grand Opening Ribbon Cutting. 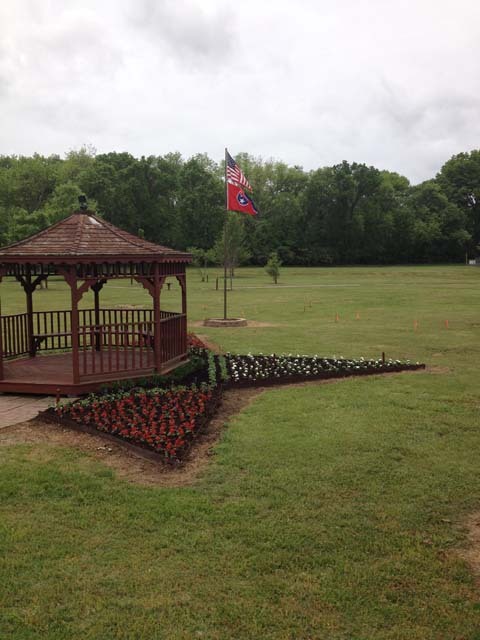 Tennessee School for the Blind Chorus performs the Star Spangled Banner during the grand opening. Williamson County Lions Club President Chuck Sheriff welcoms everyone to the grand opening. Williamson County Lions Club member Marjorie Crowell introduces the members of the Tennessee School for the Blind Chorus. Audience members listening to the Tennessee School for the Blind Chorus performing during the grand opening. The Tennessee School for the Blind Chorus Students perform one of three songs during the grand opening. Williamson County Mayor Rogers Anderson was one of the speakers during the grand opening. Kelly West speaks about her father Brad Veevers whose memorial fund provided the Lion Fountain to the Sensory Garden for the Blind. 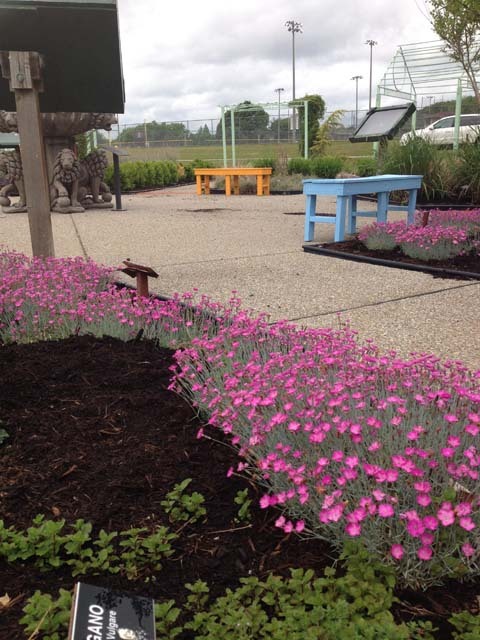 Sensory Garden for the Blind Sponsorship Sign. 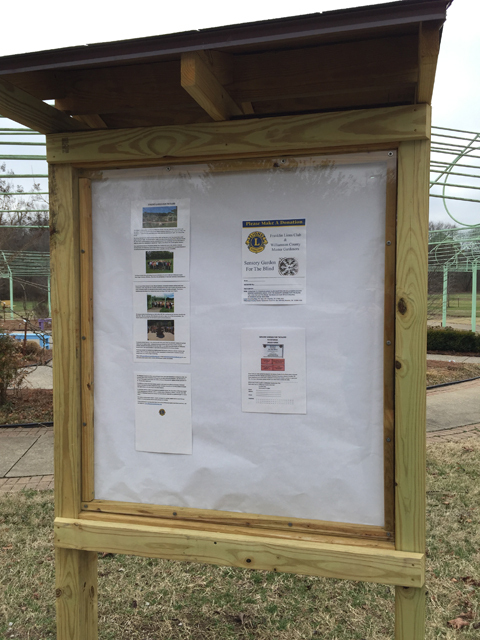 Lions Club Banners who assisted with the Sensory Garden for the Blind. 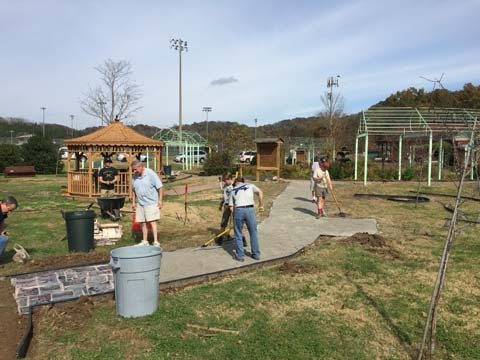 Lions Club Members escorting Tennessee School for the Blind Students through the Sensory Garden for the Blind. 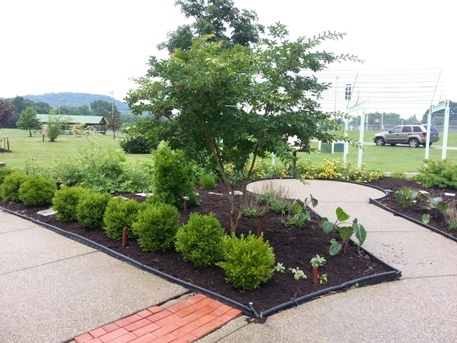 Lion Peter Alderman with a Tennessee School for the Blind Student in the Sensory Garden for the Blind. 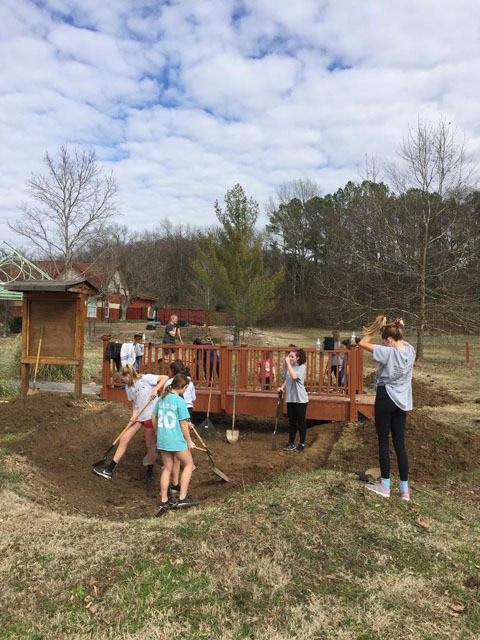 Lions Club Members and Tennessee School for the Blind Students at the Lion Fountain in the Sensory Garden for the Blind. Future Leader Dog Allie enjoys the Sensory Garden for the Blind Grand Opening. Lions working on display cases for Sensory Garden for the Blind. Alan Corey with the Battle of Franklin Trust talks to our club about The Carter House. 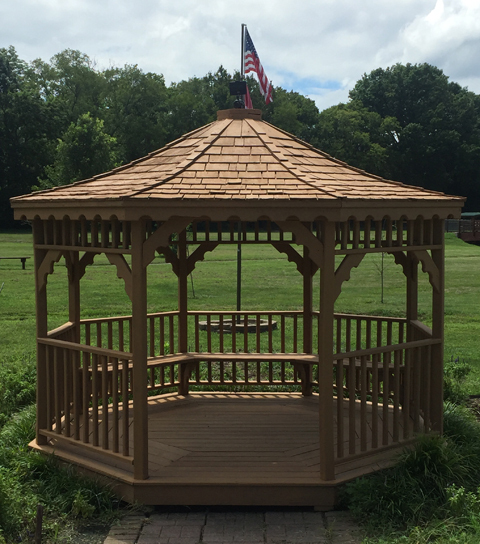 Franklin Evening Lions Club makes $920 contribution to Franklin Lions Clubs Charities for Sensory Garden for the Blind Brick Pavers. Lions Diane Crowell Adams and Mike Anderson delivered canned foods donated to Graceworks. 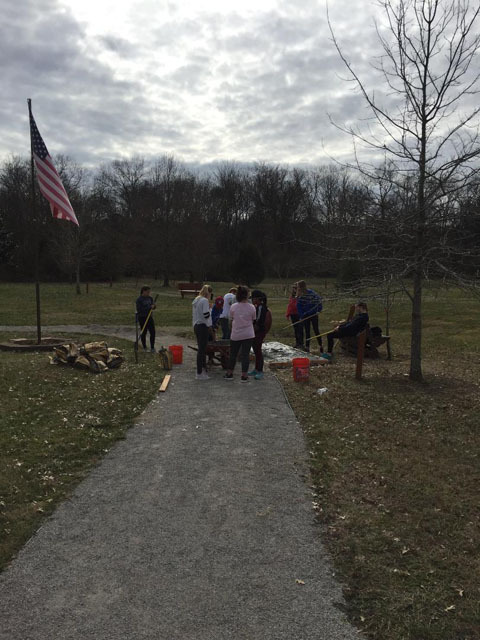 Cub Scouts contributed canned food items as part of their admission fee. 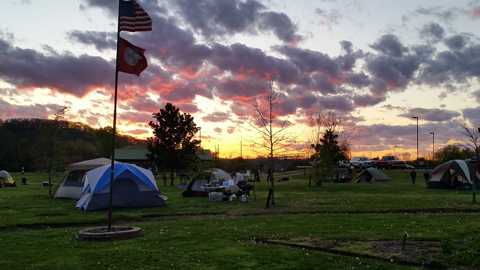 Lions Club Members working during the Cub Scout Jamboree. 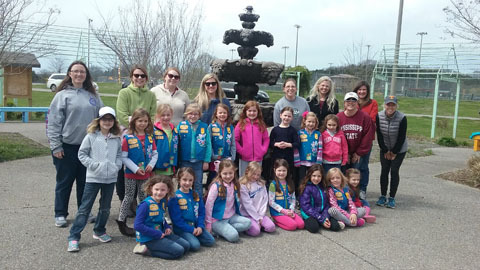 Cub Scouts looking at the Lion Fountain during the Cub Scout Jamboree. 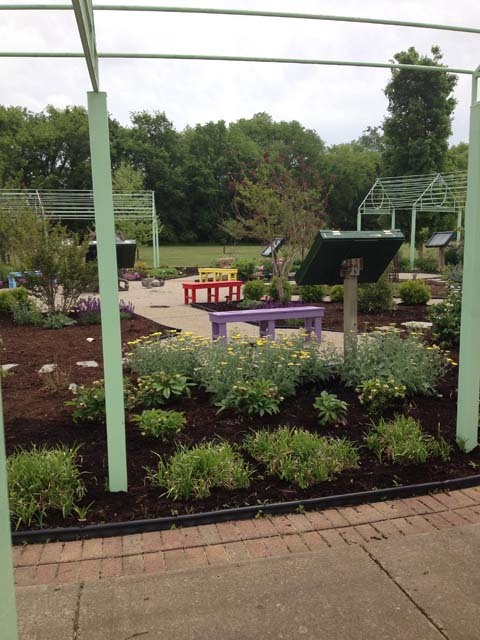 The Williamson County Lions Club hosted a Cub Scout Jamboree at the Sensory Garden for the Blind. Our club listened to Knox Brewer and Susan Gregory talk about Saddle Up which is a Therapeutic Horse Riding Program for children with disabilities. Former National Hockey League Player Jim McKenzie was our guest speaker pictured with several of the Williamson County Lions Club Members. 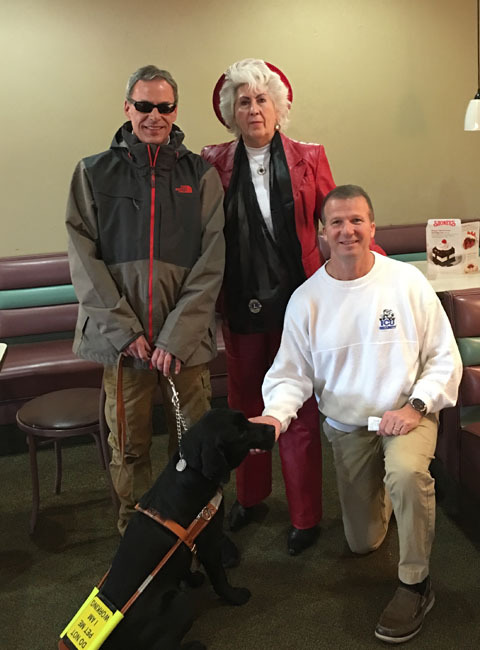 Jim Oldham who is the Superintendent for the Tennessee School for the Blind was our Guest Speaker at the Christmas Party. 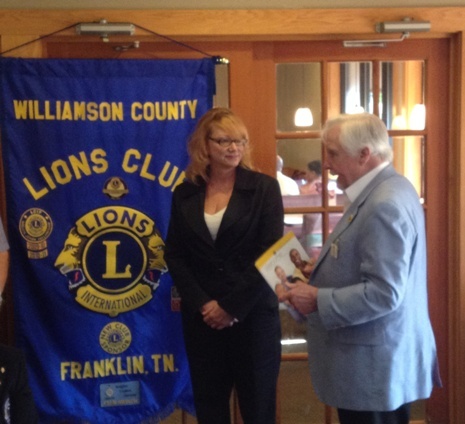 New Williamson County Lion Debra Sheridan being inducted by Lions Debbie Neighbors and Chuck Sheriff. 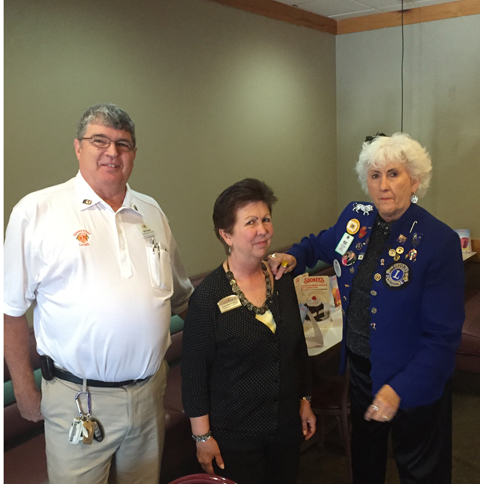 Club Officers bing installed by District Governor Ann Young at the Williamson County Lions Club Charter Night.